Brains regulate behavioral responses with distinct timings. Here we investigate the cellular and molecular mechanisms underlying the timing of decision-making during olfactory navigation in Caenorhabditis elegans. We find that, based on subtle changes in odor concentrations, the animals appear to choose the appropriate migratory direction from multiple trials as a form of behavioral decision-making. Through optophysiological, mathematical and genetic analyses of neural activity under virtual odor gradients, we further find that odor concentration information is temporally integrated for a decision by a gradual increase in intracellular calcium concentration ([Ca2+]i), which occurs via L-type voltage-gated calcium channels in a pair of olfactory neurons. In contrast, for a reflex-like behavioral response, [Ca2+]i rapidly increases via multiple types of calcium channels in a pair of nociceptive neurons. Thus, the timing of neuronal responses is determined by cell type-dependent involvement of calcium channels, which may serve as a cellular basis for decision-making. Animals use information from their environment to make decisions, like where to go, what to eat, and with whom to mate. This information may be changing or confusing, and decisions may be quick when the sensory information is clear, or slower when the sensory clues are muddled. Scientists often study this kind of decision-making in monkeys and rodents, but it can be hard to pinpoint the exact decision-making mechanisms because these animals have hundreds of millions neurons in their brains. Studying the mechanisms that underlie decision-making can be easier in a simpler organism with fewer neurons. A tiny roundworm called Caenorhabditis elegans is one such creature, with only 302 neurons. These worms avoid noxious odors, by first wandering around when they detect the odor, and then fleeing. About 80% of the time the worms flee in the correct direction to escape the foul smell. However, it was not clear how the worms decided which direction to flee. Now, Tanimoto, Yamazoe-Umemoto et al. show that the worms choose which direction to move by mathematically calculating information about odor concentrations. In the experiments, a robotic microscope simultaneously measured nerve activity and the worm’s behavior while an odor was presented. Specifically, the amount of calcium in the neurons was measured. The experiments showed that when the worms were wandering to determine which direction to flee the amount of calcium in the neurons changed in proportion to how much the concentration of the odor changed overtime. The experiments suggest that the animals use a mathematical process called integration to add up the changes in the concentration of the odor over time, and when the total reaches a certain threshold the animal successfully moves away from the source. Tanimoto, Yamazoe-Umemoto et al. also identified the gene that enables these calculations. More complicated animals make similar calculations that take into account environmental changes over time when making a decision. Future experiments are needed to determine if more complex animals also use the same mechanism as C. elegans, and whether the same gene is responsible. Brains process sensory information to generate various kinds of physiological responses with different timings (i.e., with different latencies to respond): For example, motor control, foraging, decision-making and the sleep-wake cycle range on timescales from milliseconds to days (Buhusi and Meck, 2005; Richelle and Lejeune, 1980). In decision-making, animals choose one from multiple behavioral options based on environmental sensory information, where a temporal delay is associated with the certainty of sensory information. In primates and rodents, increases in neural activity during the delay period according to the sensory information (‘evidence accumulation’) has been described as a key physiological basis for the timing of decision-making (Carandini and Churchland, 2013; Gold and Shadlen, 2007; Schall, 2001; Shadlen and Newsome, 2001). For example, clear sensory information causes a faster rise in neuronal firing rate to a threshold and faster behavioral choice, whereas uncertain information causes a slower rise in the firing rate and slower behavioral choice. Despite their essential roles in the timing of decision-making, the neural mechanisms that generate evidence accumulation still need to be clarified. Theoretical studies suggest that evidence accumulation is mediated by recurrent neural circuits (Gold and Shadlen, 2007; Wang, 2008) while intracellular mechanisms, such as calcium signaling via N-methyl-D-aspartate (NMDA) receptors, calcium-activated nonspecific cation (CAN) channels, and/or voltage-gated calcium channels (VGCCs), have also been proposed (Curtis and Lee, 2010; Major and Tank, 2004). The cellular and molecular bases of simple decision-making have been studied in invertebrate animals because of the simplicity and accessibility of their nervous systems (Kristan, 2008). For example, a neuron that biases decisions was identified based on optical monitoring of the neuronal activities in the medical leech (Briggman et al., 2005), and genetic analyses identified a neuropeptide and a catecholamine receptor that underpin simple decision-making tasks in Drosophila melanogaster and in Caenorhabditis elegans, respectively (Bendesky et al., 2011; Yang et al., 2008). In addition, a recent behavioral study showed that Drosophila temporally accumulates sensory evidence for decision-making (DasGupta et al., 2014). However, the physiological mechanisms of these decision-making tasks have not been elucidated, and thus not discussed in terms of their possible commonalities with the mechanisms in mammals. In this study, we reveal the cellular and molecular mechanisms of the timing of decision-making in C. elegans. We first show that the animals migrate in an appropriate direction with unexpectedly high efficiency, likely based on the gradient of a repulsive odorant. From simultaneous monitoring of behavior and neural activity in virtual odor gradients, we find that two pairs of sensory neurons regulate this behavioral response in an opposing manner with different temporal dynamics. A pair of ASH nociceptive neurons exhibits a time-differential-like response to an increase in the odor concentration, which leads to a bout of turns in random directions similar to a ‘reflex’. In contrast, a pair of AWB olfactory neurons exhibits a time-integral response to a decrease in the odor concentration, which leads to turn suppression with a temporal delay resembling ‘deliberation’. The AWB response is mediated by a gradual calcium influx mainly via L-type VGCCs whereas the ASH response is mediated by a rapid calcium influx via multiple types of calcium channels. Thus, our results indicate that the timing of a sensory response, such as deliberate decision-making or rapid reflex, is determined by cell type-dependent involvement of calcium channels. 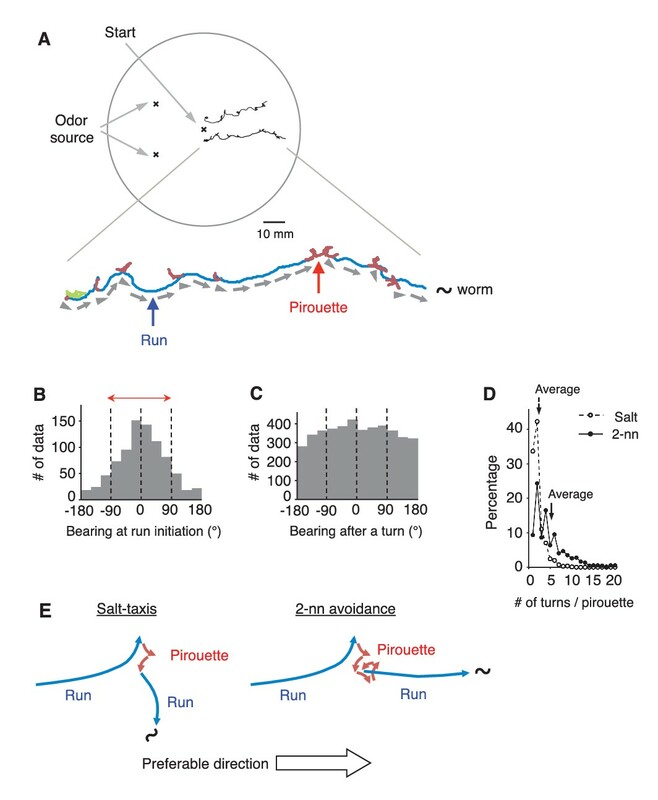 C. elegans avoids the odorant 2-nonanone, and this odor avoidance behavior is regulated by stimulus-dependent transitions between the two behavioral states, ‘pirouette’ (a period of short migrations divided by turns) and ‘run’ (a period of long straight migration) (Figure 1A and Figure 1—figure supplement 1A) (Bargmann et al., 1993; Kimura et al., 2010). The pirouette strategy (a form of ‘biased random walk’) is the major behavioral strategy used by these animals for chemotaxis and thermotaxis, and the choice of migratory direction at run initiation is considered to be random in this strategy (Lockery, 2011; Pierce-Shimomura et al., 1999). We found, however, that C. elegans appropriately chose the migratory direction in 2-nonanone avoidance: 78.4% of the migratory directions at run initiation and 83.5% during runs were away from the odor source (Figure 1B and Figure 1—figure supplement 1B). Thus, during odor avoidance, animals chose the appropriate direction about four times more frequently than the inappropriate direction (~80% versus~20%). This probability of run initiation in the appropriate direction for odor avoidance was far higher than that in salt-taxis, the best-studied chemosensory behavior of the animal (59.3% in Figure 1—figure supplement 1C and D, and ~56% in Pierce-Shimomura et al., 1999), and the probability exceeded, or was at least comparable to, that of odor-taxis in Drosophila larvae (73.9%) (Gomez-Marin et al., 2011; Louis et al., 2008). Appropriate directions were chosen from multiple exploratory short migrations in random directions during pirouettes (Figure 1C and D). These results indicate that C. elegans can efficiently choose the appropriate migratory direction on a repulsive odor gradient (Figure 1E). C.elegans selectively initiates runs away from the odor source. (A) Examples of the tracks of 2 animals during 12 min of 2-nonanone avoidance assay, overlaid on a schematic drawing of a 9 cm plate. One of the tracks is magnified below. In the magnified view, pirouettes are red and runs are blue. Arrow heads and arrows indicate the directions of run initiation and those during runs, respectively. (B) Histogram indicates the bearings at run initiation during 2-nonanone avoidance (i.e., the bearing of the arrow heads in panel A, and the initial bearing of the blue arrows in panel E). The bearing was determined as B = 0° when animals migrated directly away from the odor source (= down the gradient) and ±180° when they migrated directly toward the source (= up the gradient). Migration away from the odor source (i.e., within ±90° bearings; red arrow) comprised 78.4% of all data. (C) Histogram indicates all the bearings after a turn during pirouettes, including those that later switched to runs (i.e., the initial bearings of the red plus blue arrows in panel E). (D) Percentages of turn numbers per pirouette during 2-nonanone avoidance (solid line and filled circles) and in salt-taxis (dashed lines and open circles). The average number of turns in a pirouette was significantly larger during 2-nonanone avoidance than in salt-taxis (5.2 vs. 2.2 indicated by arrows, respectively; p<0.001 by Mann-Whitney test). (E) Schematic drawings of salt-taxis and 2-nonanone avoidance. Typical chemotaxis such as salt-taxis in C. elegans is regulated by the pirouette (i.e., biased random walk) strategy, where the animal initiates runs mostly in a random direction after a pirouette (Pierce-Shimomura et al., 1999). In contrast, in 2-nonanone avoidance, an appropriate migratory direction is chosen from multiple trials in a pirouette. We refer to this as the ‘pivot-and-go’ strategy. All the statistical details are shown in Supplementary file 1. For panels B, C and D (2-nonanone avoidance), the data are from 100 wild-type animals. Panel D (salt-taxis) is from 64 wild-type animals. The following figure supplement is available for Figure 1. Next, to understand the correlations between sensory information and appropriate directional choice, we developed a method for measuring and determining the dynamic spatio-temporal pattern of the naturally evaporating and diffusing odor gradient (Figure 2A and Figure 2—figure supplement 1A–D, and Video 1). The measured odor gradient was then used to calculate the odor concentrations that each animal experienced at each position at every second (Cworm in the middle panels of Figure 2B and Figure 2—figure supplement 1E). We found that the temporal changes in Cworm (dCworm/dt) were strongly correlated with the two behavioral states of the animals (the bottom panels of Figure 2B and Figure 2—figure supplement 1E, and Figure 2C). During pirouettes, the dCworm/dt values were mostly positive because the animals did not migrate much while the odor concentration on the plate was increasing due to sustained evaporation of the odor from the source (Figure 2—figure supplement 1D and Video 1). During runs, in contrast, dCworm/dt values were mostly negative because the animals migrated down the gradient. These correlations may suggest that pirouettes and runs are caused by positive and negative dCworm/dt, respectively. In addition, we further found that the relationships between animals' responsiveness and instantaneous dCworm/dt largely differed between pirouettes and runs (Figure 2D), suggesting that pirouettes and runs are physiologically distinct behavioral states in terms of sensory response. Taken together, these results suggest that the efficient transitions between discrete behavioral states based on odor concentration information may lead to the appropriate choice of migratory direction as a simple form of decision-making. Pirouettes and runs are distinct behavioral states, which are associated with positive and negative dCworm/dt, respectively. (A) Fitted odor gradient over the assay plate at 12 min, based on the actual measurements shown in Figure 2—figure supplement 1D. (B) (Top) Same with the magnified view of an animal's trajectory in Figure 1A. (Middle, bottom) Graphs showing the 2-nonanone concentration (Cworm: middle) or temporal changes in it (dCworm/dt: bottom) at this animal's position at each second during the odor avoidance behavior. As in Figure 1A, pirouettes and runs are red and blue, respectively. Most of the animals did not migrate much during the first 2 min and were excluded from the analysis (green) because of the rapid increases in the odor concentration during this period. See also Figure 2—figure supplement 1E for another example. (C) Correlation between dCworm/dt and pirouettes or runs. dCworm/dt of 2-nonanone was plotted against the animal's x position for each second during pirouettes (top) or runs (bottom). The bars represent the median ± quartiles for each 5 mm fraction. (D) The responsiveness to the instantaneous dCworm/dt differed between pirouettes and runs. 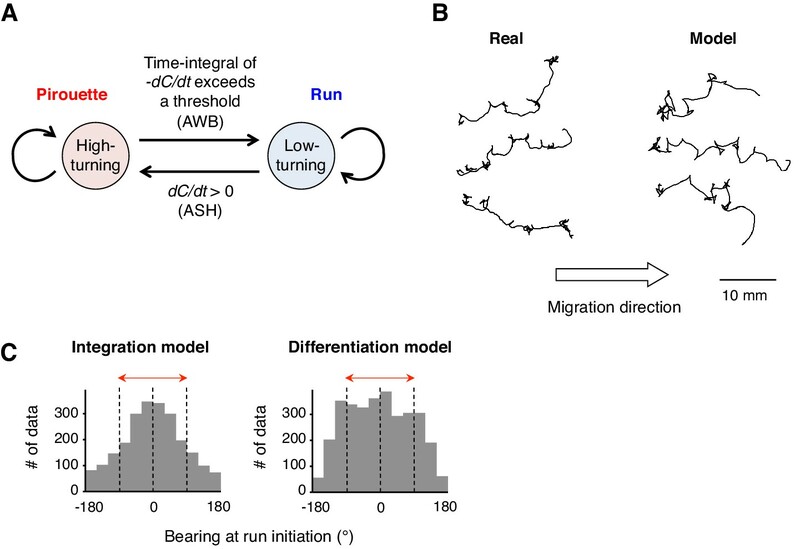 The turning rate was determined as the relationship between dCworm/dt during one second of migration and the probability of turning in the next second. Average turning rates ± SEM for every 0.005 μM/s bin during pirouettes (red line) or runs (blue line) are shown. The data in panels C and D are from the same 100 wild-type animals as in Figure 1. The following figure supplement is available for Figure 2. Time-course changes in the fitted 2-nonanone concentration. Although the odor sources were two circles of ~5 mm diameter in the real experiment, they were treated as points in the simulation. To determine whether sensory stimuli are the causal reason for the behavioral response during odor avoidance, and the neural mechanisms linking stimulus and behavior, we developed a novel integrated microscope system for the quantitative optophysiological analyses of freely moving C. elegans on virtual odor gradients. We integrated the OSB system, an auto-tracking microscope system for calcium imaging and optogenetic analyses of neuronal activity in C. elegans (Video 2), with an odor-delivery sub-system (Busch et al., 2012; Tanimoto et al., 2016). Using this new OSB2 system, a moving C. elegans was continuously exposed to an odor flowing from syringe pumps (Figure 3A and Figure 3—figure supplement 1A, and Video 3). The odor concentration in the flow changed according to a predefined program, based on estimated values experienced in the plate assay paradigm (Figure 2). Using the OSB2 system, we first tested whether the dC/dt of the odor itself could regulate an animal's behavior. When animals experienced temporal increases in the odor concentration, they exhibited more frequent turns like in pirouettes (Figure 3B). Conversely, when they experienced temporal decreases, they suppressed turns and exhibited long migrations similar to runs (Figure 3B). During the odor-down phase, no statistical bias was detected in migratory direction (Figure 3—figure supplement 1B). These results indicate that C. elegans responds to temporal changes in the odor concentration and regulates turning rates. 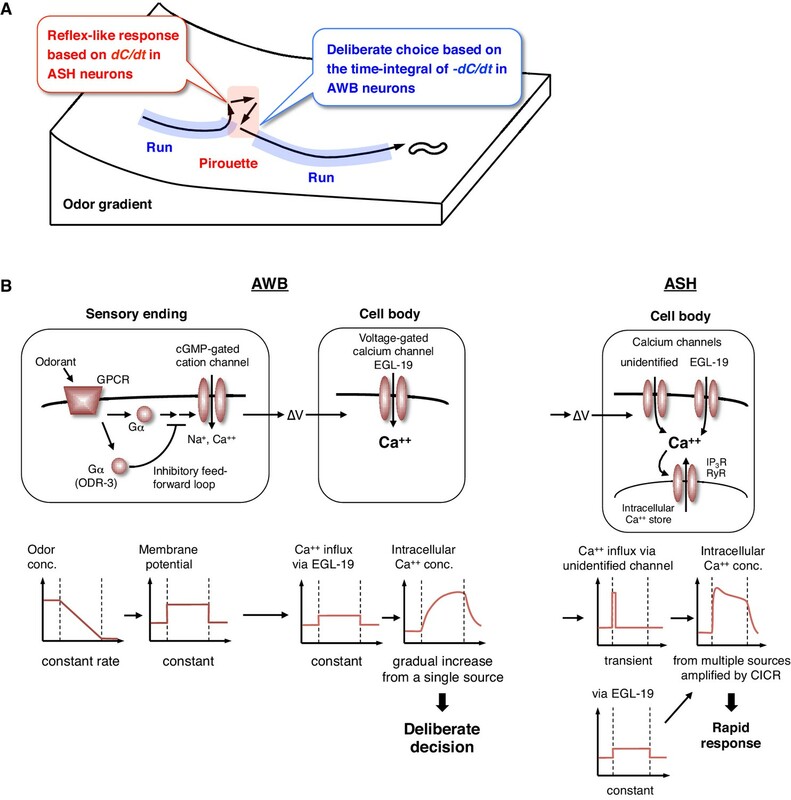 AWB and ASH sensory neuron pairs regulate turning rate in response to dC/dt of 2-nonanone. (A) Schematic drawing of the OSB2 system. (B) Behavioral response to temporal changes in the 2-nonanone concentration. (Top) Track of a wild-type animal. The first 60 s (gray) is a period of no odor (‘odor-zero phase’ in the bottom left panel), 60–90 s (black) is a period with a constant increase in odor concentration from 0 to 1 μM (‘odor-up phase’), and 90–180 s (gray) is a period with a constant decrease in odor concentration from 1 to 0 μM (‘odor-down phase’). Red dots indicate turns. (Bottom left) Rastergram of turns. The upper portion of the panel shows the measured 2-nonanone concentration in the flow. In the lower portion of the panel, each turn is denoted by a dot, and each row represents the behavioral record of a single animal during the 180 s of analysis. The results of 20 animals are shown. (Bottom right) Ensemble averages ± SEM for the turning rate (turns per second) during each phase in the left panel (n = 20). The turning rates in the three conditions differed significantly from each other (***p<0.001, Kruskal-Wallis test with post hoc Steel-Dwass test). (C) Response of AWB neurons. The averages ± SEM of ∆F/F0 for GCaMP3 (middle) and rastergram of turns of the animals (bottom) are shown (n = 9). (D) Effect of optogenetic activation of AWB neurons on the turning rate in the absence of odor. Transgenic animals expressing ChR2(C128S), a bi-stable variant of ChR2, in AWB were cultivated in the absence or presence of all-trans-retinal (ATR) (dashed or solid bars, respectively); exogenous ATR is required for functional ChR in C. elegans (Nagel et al., 2005). Average turning rates ± SEM of the 30 s periods before (gray bars) or after blue light illumination for 3 s (blue bars) are shown (n = 20 each). **p<0.01 (Mann-Whitney test). (E) Calcium imaging of ASH neurons using GCaMP3 (n = 7). 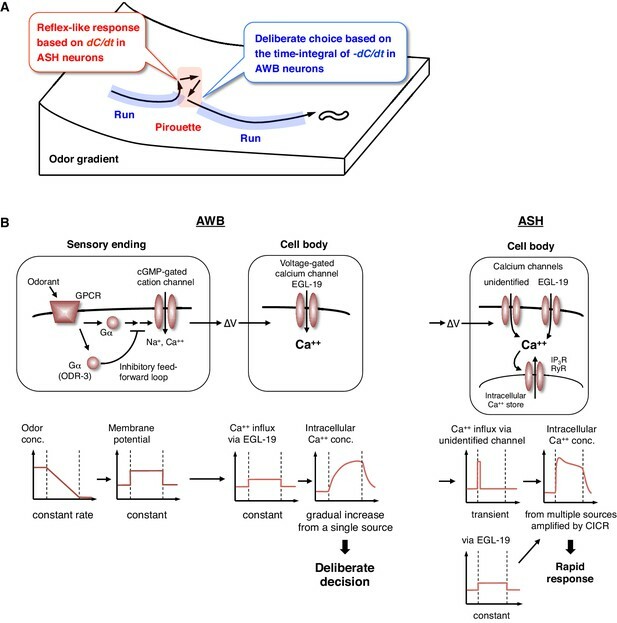 (F) Effect of optogenetic silencing of ASH neurons on the turning rate. The transgenic animals expressing Arch in ASH neurons were cultivated in the absence or presence of ATR (dashed or solid bars, respectively) and illuminated with green light during the up-phase (n = 16 each). The odor pattern was the same as that in panels B, C, and E. *p<0.05 (Mann-Whitney test). (G) Model of the regulation of odor avoidance by ASH and AWB neurons. All the statistical details are shown in Supplementary file 1. The following figure supplement is available for Figure 3. A demonstration video for calcium imaging with the OSB2 system. (Left) The bright field images for the tracking and the fluorescence images for calcium imaging were acquired simultaneously but separately in the tracking and calcium imaging subsystems, respectively. The video was compiled separately because of the different frame rates and ran on a Power Point file. Because of a technical limitation on the video playing, the videos were not completely synchronized. (Right) From the fluorescence images, the cell body of AWB neuron was tracked and centered off-line. The video speed is 2.8x. Visualization of the odor flow on the OSB2 system. The view was from the ocular lens of the microscope. The tube end was on the left and the flow was from the left to the right, which was visualized by fog produced by Wizard Stick (Zero Toys, USA). Contrast of the video image was enhanced for visualization of the flow. The worm was immobilized for reference. The video speed is 1x. We then performed calcium imaging of neural activity and revealed that two pairs of sensory neurons regulate the avoidance behavior by responding to either increases or decreases in the odor concentration. In C. elegans' sensory neurons, dynamic changes in [Ca2+]i in the cell bodies are generally similar to those in axons, which cause neurotransmitter release from the neurons (Kato et al., 2014; Zahratka et al., 2015). First, we investigated a pair of AWB olfactory neurons. AWB neurons are known to be primarily responsible for 2-nonanone avoidance and to exhibit an odor-OFF response when animals were stimulated with 2-nonanone-saturated buffer in a stepwise manner (Ha et al., 2010; Troemel et al., 1997). However, it was not clear whether and how AWB neurons respond to gradual and/or subtle changes in odor concentration in the air phase. We found that AWB neurons were gradually and continuously activated during the odor-down phase for 90 s (Figures 3C, 90–180 s). 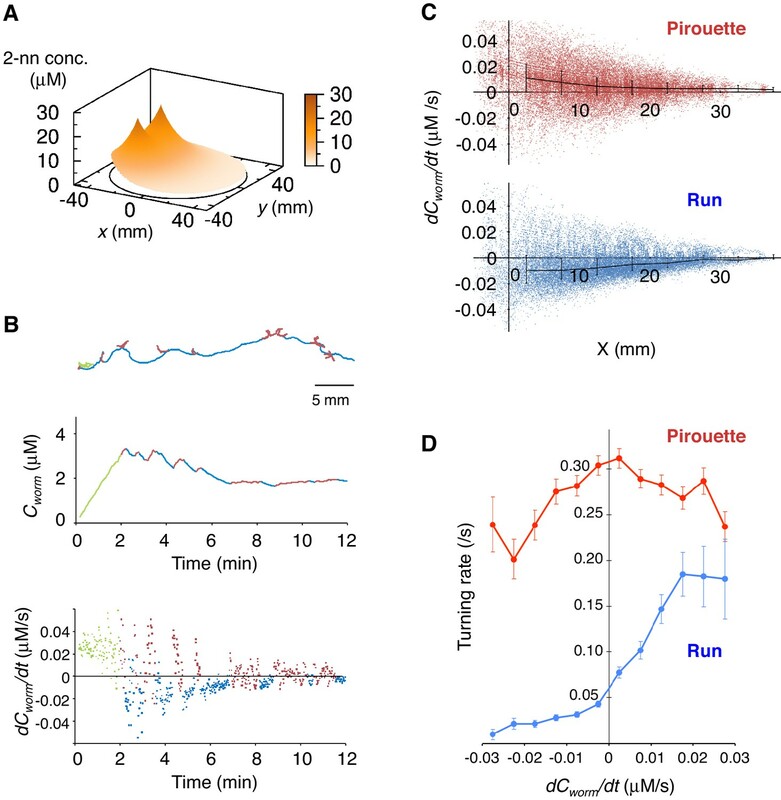 Optogenetic activation of AWB neurons by the bi-stable variant of the light-gated cation channel ChR2(C128S) (Berndt et al., 2009) significantly suppressed turns in the absence of the odor (Figure 3D and Video 4). In addition, we also found that ASH neurons, a pair of nociceptive neurons (Bargmann, 2006; Kaplan, 1996), were activated by an odor increase (Figures 3D, 60–90 s). Consistently, optogenetic inactivation of ASH neurons during the odor-up phase by the light-driven H+ pump Arch (Chow et al., 2010) significantly suppressed the increase in the turning rate (Figure 3F). Taken together, these results indicate that two distinct sensory pathways respond to the physiological range of odor concentration changes and opposingly regulate the avoidance behavior (Figure 3G). Optogenetic activation of AWB neurons. After 60 s without any stimulus, a transgenic animal expressing the bistable variant of channelrhodopsin, ChR2(C128S), was illuminated with blue light for 3 s to cause sustained AWB activation, and the behavior was monitored for the following 30 s. The video speed is 8x. Through mathematical analyses of ASH and AWB responses, we found, unexpectedly, that the two neuron pairs decode the temporal dynamics of odor concentration information using different computations. When C. elegans was stimulated with different rates of positive dC/dt, the ASH neurons were always activated rapidly (Figure 4A, black lines in middle panels). These responses peaked soon after the onset of the odor-up phase and were mostly maintained during this phase, which can be approximated by time-differentials of the odor concentrations (i.e., dC/dt: Figure 4A, red lines in middle panels; see also Table 1). The time-differential response of sensory neurons is consistent with recent studies (Lockery, 2011; Schulze et al., 2015) and the general idea that sensory neurons respond in a phasic manner by detecting stimulus changes (Delcomyn, 1998). A portion of ASH response (e.g., decay kinetics during the odor-plateau phase) was not well fitted by the time-differential equation, which reflected the fact that ASH response is regulated by multiple mechanisms (see below). 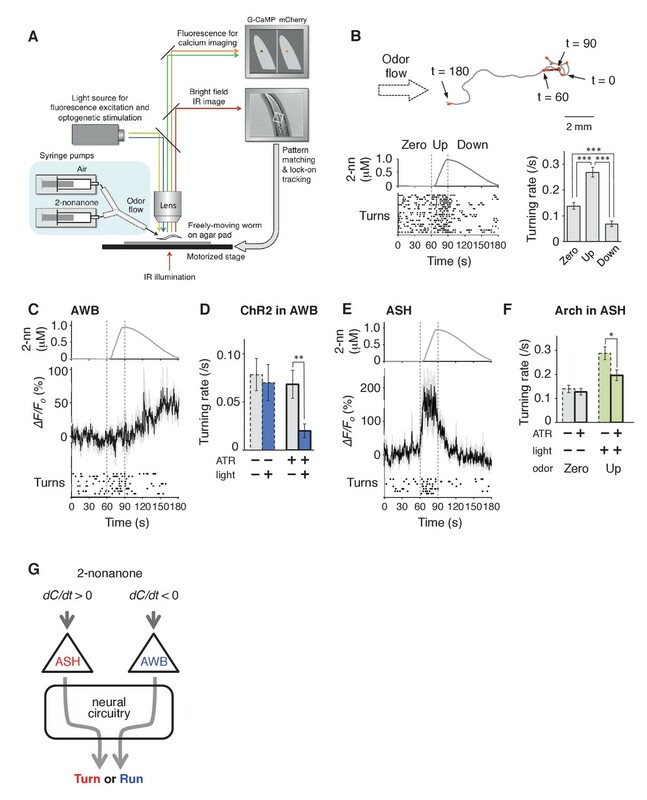 ASH neurons are activated according to dC/dt for initiating turns, and AWB neurons are activated according to the leaky integration of the negative dC/dt for suppressing turns with a dC/dt-dependent delay. (A) ASH responses (middle panels) and turns (lower panels) in response to odor concentration increases from 0 to 1 μM in 45 s (left most; n = 32), 90 s (middle left; n = 39), 180 s (middle right; n = 35) or no odor increase (‘no odor control’; right most; n = 41) are shown. (Middle panels) In the three conditions with odor increases, the response patterns of ASH neurons (the average ± SEM: black lines and gray shadows, respectively) were fitted by time-differentials of the average of measured odor concentration (red lines), calculated by the rightmost equations. (Lower panels) Ensemble averages of the turning rates ± SEM in each 10 s bin were calculated. The original data is shown in the raster plot. Black horizontal dashed lines in lower panels indicate the upper limit of 99% prediction interval of all the turning rates during the odor-zero phase (t = −60 ~ 0; gray area). Red vertical dotted lines indicate the time when each turning rate first exceeded the upper limit of prediction interval. In the first bin of odor-up phase (indicated by a black horizontal bar in the lower panels), the turning rate in the 45 s and 90 s conditions increased significantly compared to the no-odor control (***p<0.001, Kruskal-Wallis test with post hoc Steel-Dwass test). (B) AWB responses and turns in response to odor concentration decreases from 1 μM (odor-plateau phase; gray area) to 0 μM (odor-zero phase) in 45 s (left-most; n = 42), in 90 s (middle left; n = 43), in 180 s (middle right; n = 48) and no odor decrease (‘odor-plateau control’; right-most; n = 38). AWB responses to different dC/dt rates were fitted by a leaky integrator equation of negative dC/dt (red lines). Black horizontal dashed lines in the lower panels indicate the lower limit of the 99% prediction interval of the turning rates during the odor-plateau phase. The times when the turning rates became lower than the limit (red vertical dotted lines) were delayed when the dC/dt rate was smaller (*p<0.005 and ***p<0.001, Kruskal-Wallis test with post hoc Steel-Dwass test). The statistical test was performed in the first 3 bins of the odor-down phase (a black horizontal bar in lower panels). (C), Effect of optogenetic silencing of the AWB response on negative dC/dt. Transgenic animals expressing Arch in AWB neurons were cultivated in the absence (n = 18) or presence (n = 19) of ATR and illuminated with green light during the odor-down phase. *p<0.05, **p<0.01, and ***p<0.001 (Mann-Whitney test). In the panels, the gray shading means the period with no odor change, in which the prediction intervals were calculated. All the statistical details are shown in Supplementary file 1. The following figure supplements are available for Figure 4. Models and parameters used in the fitting of ASH responses with time-differential equations. The behavioral response also changed rapidly: At the onset of the odor-up phase, the turning rates exceeded the upper limit of the 99% prediction interval for the rate during the odor-zero phase (Figure 4A, red vertical dotted lines in lower panels): The 99% prediction interval is a value in which future data (odor-up phase in this case) will fall with 99% probability based on the observed data (odor-zero phase) (Montgomery and Runger, 2002). In the 45 s and 90 s odor-up conditions (left-most and middle left panels), the turning rates were significantly different from the no odor control (see Supplementary file 1 for statistical details). It should be noted that, even with the slowest odor concentration increase (middle right panel), at which the overall turning rate was around the threshold, the turning rate increased and surpassed the threshold at the onset of the odor-up phase although no statistical difference was detected. These results suggest that the nociceptive ASH neurons compute the time-differential of odor concentration to rapidly cause an aversive response based on a small change in odor concentration. In contrast, the AWB responses to decreases in odor concentration were time-integral. The responses gradually increased and peaked with a considerable delay, which depended on the dC/dt rates after the onset of the odor-down phase (Figure 4B, black lines in middle panels). These responses could not be fitted by the dC/dt itself but by a leaky integrator equation, in which -dC/dt acted as the input (Figure 4B, red lines in middle panels and Figure 4—figure supplement 1; see also Table 2 for parameters and Table 3 for goodness of fit). In the leaky integrator model, the neuronal response is given by the sum of the past inputs, which decreases exponentially due to leakage. Furthermore, we estimated [Ca2+]i by including a sigmoidal relationship between calcium concentration and fluorescence intensity into the model (Akerboom et al., 2012; Kato et al., 2014). The estimated calcium concentration exhibited a similar pattern to the measured fluorescence change with an estimated basal concentration of about 60–90 nM (Figure 4—figure supplement 2 and Table 2), similar to that generally reported for resting neurons in general (~100 nM) (Clapham, 2007). Taken together, these results suggest that AWB neurons compute the leaky integration of the negative dC/dt to temporally integrate the sensory information as the accumulation of [Ca2+]i. Models and parameters used in the fitting of AWB responses with leaky integrator equations. Parameters and goodness of fit results for mathematical models of ASH and AWB responses. The dC/dt rate-dependent delay in AWB activation was correlated with the behavioral responses. The time when the turning rate became lower than the 99% prediction interval of the odor-plateau phase was delayed according to the dC/dt rate, which was associated with statistical differences from the odor-plateau control (Figure 4B, red vertical dotted lines in lower panels). This result suggests that the turning rate is suppressed when the AWB activity exceeds a certain value (Figure 4B, red horizontal arrows in middle panels). Interestingly, even when animals were stimulated with the most shallow odor gradient in which the average turning rate appeared gradually decreased (middle right panels in Figure 4B), turn intervals of each animal could be classified into two groups like pirouettes and runs (compare Figure 1—figure supplement 1E with 1A). This result suggests that, even with subtle changes in odor concentration, the behavioral response of C. elegans does not change gradually, but instead transits between high- and low-turning states. Optogenetic suppression of the AWB neurons with Arch during the odor-down phase significantly affected the transition (Figure 4C). Taken together, these results indicate that AWB neurons regulate the transition from a pirouette to a run based on temporal integration of the negative dC/dt. To further understand whether the neural computations of odor concentration contribute to the choice of migratory direction during decision-making, we performed computer simulations of the odor avoidance behavior (Figure 5A). During pirouettes, the model animal frequently repeated turns and short migrations in random directions, and a pirouette transited to a run when the time-integral of -dCworm/dt over time reached a threshold value. The model produced similar migration patterns to the odor avoidance behavior seen in real animals, in which most of the runs were down the odor gradient (Figure 5B). Interestingly, when we changed the model animal's computation for transition of a pirouette to a run from the temporal integration of dC/dt (the integration model) to the simple dC/dt itself (the differentiation model), the directional choice at run initiation significantly worsened (Figure 5C; p<0.001, Mardia-Watson-Wheeler test). This is because, in the differentiation model, the animals initiated runs even when they transiently sensed dC/dt <0, due to the periodical head swing for example (Iino and Yoshida, 2009; Yamazoe-Umemoto et al., 2015). In contrast, animals in the leaky integration model initiated runs only when they sensed dC/dt <0 for a certain period of time, resulting in an appropriate directional choice. In reality, the movement of the animal's anterior end (where the sensory endings of the ASH and AWB neurons are exposed to the environment) is more random than that in our model (Videos 2 and 4), suggesting that the temporally integrating property of AWB neurons may play a significant role in robust directional choice based on a noisy sensory input. A computer model reproduced the directional choice in the odor avoidance task in a temporal integration-dependent manner. (A) Model of the behavioral transition in 2-nonanone avoidance. During a pirouette, a model animal frequently repeated turns and short migrations. When a model animal initiated a migration away from the odor source and sensed dC/dt <0, the high-turning state transited to a low-turning state (i.e., a run) when the leaky integrator equation exceeded a threshold. During a run, the animals turned with much lower frequency than in pirouette and at a probability related to dC/dt >0 due to straying away from the original direction. (B) Three typical tracks of real (left) and model (right) animals. As shown in Figure 1A, the odor source is on the left side. (C) Histograms of the initial bearings of runs in the model animals. The high-turning-to-low-turning transition was dependent on temporal integration (left) or on differentiation (right). p<0.001 (Mardia-Watson-Wheeler test). All the statistical details are shown in Supplementary file 1. Temporally integrating neural activity for decision-making and working memory is considered to be based on recurrent synaptic circuits in vertebrates (Aksay et al., 2007; Wang, 2008). To determine whether a synaptic circuit input is required for the temporally integrating property of AWB neurons, we abolished the transmission of synaptic and/or dense core vesicles in most, if not all, neurons via a mutation in unc-13 or unc-31, the orthologs of mammalian Munc-13 and CAPS (calcium activated protein for secretion), respectively (Richmond, 2005). In the unc-13 and unc-31 mutants, however, the AWB responses were essentially similar to that in wild-type animals and fitted with the same leaky integrator equations (Figure 6A and Table 2), indicating that the temporally integrating neural activity occurs within the AWB neuron itself and does not require a recurrent circuit. Cell-autonomous computations in AWB neurons. (A) The AWB responses of unc-13 (left) and unc-31 (right) mutants to the odor decreases, which are the same as those shown in the middle left panel of Figure 4B, were essentially similar to those of wild-type animals and fitted by the leaky integrator equations (n = 31 and 17, respectively). (B) The AWB responses of odr-3(n2150) mutants (n = 24) were fitted by the leaky integrator equation (red solid line) with the time interval (∆t) being much longer than that of wild-type AWB (red dotted line). The parameters are described in Table 2. In the experiments for panels A and B, the behavioral responses were not analyzed because the unc-13, unc-31, and odr-3 mutations affect the activities of multiple neurons, including ASH and AWB. To reveal the molecular mechanisms of the temporal integration of sensory information in AWB neurons, we performed genetic manipulations. First, we identified the gene required for the calculation of dC/dt. Previous genetic studies suggest that the signaling pathway mediating odor response in AWB neurons is similar to that in mammalian olfactory/photoreceptor neurons. Upon binding to an odorant, a G-protein coupled receptor activates Gα protein, which eventually leads to the opening of cyclic nucleotide-gated cation channels for depolarization (Bargmann, 2006). ODR-3, one of the 20 Gα homologs in C. elegans, is expressed in AWB, ASH and a few other pairs of sensory neurons. It is localized at the sensory ending, and its dysfunction causes severe chemotaxis defects, suggesting that ODR-3 transduces the sensory signal from odorant receptor (Roayaie et al., 1998). Two alleles of loss-of-function mutations of the odr-3 gene, however, caused gradual activations of AWB neurons, whose peaks were even larger than those of wild-type animals (Figure 6B and Figure 6—figure supplement 1A, black lines), suggesting that ODR-3 may play an inhibitory role in sensory signaling. 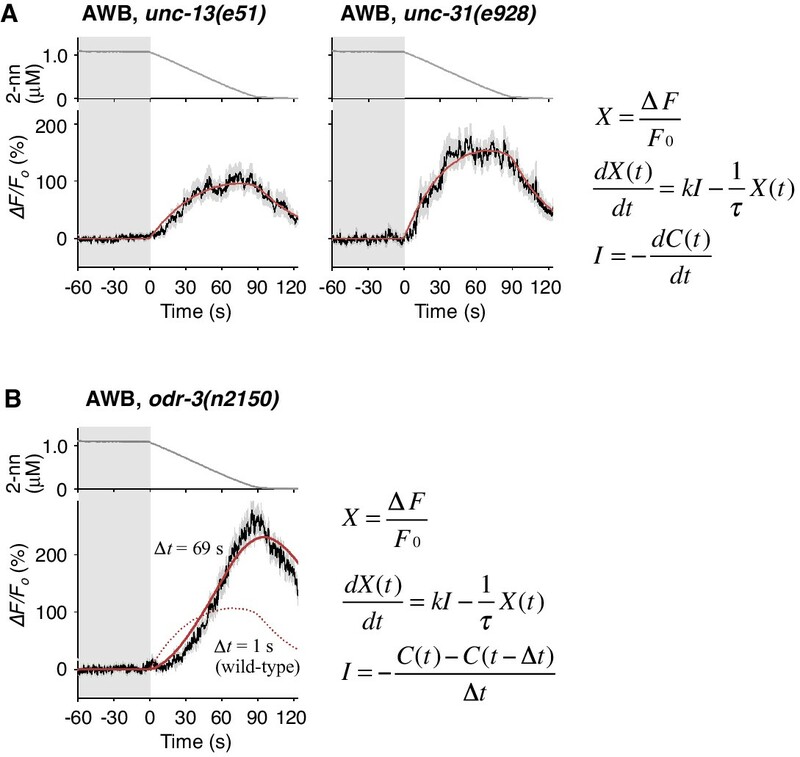 Interestingly, while the AWB response patterns in wild-type animals were fitted by a leaky integrator equation with a time interval for the input (∆t)=1 s (solid red lines in Figure 4B and dotted red line in 6B), AWB response patterns in odr-3 mutants were better fitted by an equation with ∆t longer than 1 min than by ∆t = 1 s (solid red line in Figure 6B, Figure 6—figure supplement 1A; see also Table 2 for parameters and Table 4 for goodness of fit). Thus, the time-differential property for the sensory input was greatly degraded with the odr-3 mutations while the time-integral property was not affected. 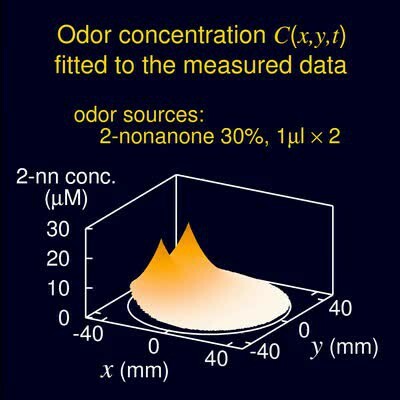 This result suggests that the time-differential computation of odor concentration depends mostly on the ODR-3 Gα protein (see Discussion for details). The result also supports the idea that AWB neurons possess a temporally integrating property for sensory inputs. The overall response of ASH neurons, which also express ODR-3, was partially affected by the odr-3 mutations (Figure 6—figure supplement 1B), suggesting that ODR-3 may play a primary role in sensory signaling in ASH neurons. Parameters and goodness of fit for mathematical models of AWB responses in odr-3 mutants. Furthermore, we genetically identified the genes responsible for the time-integral calcium accumulation. In general, [Ca2+]i increases in neurons depend on its influx through the plasma membrane via VGCCs, which can then trigger rapid calcium release from the endoplasmic reticulum (ER) via IP3 receptors (IP3Rs) and/or ryanodine receptors (RyRs) as calcium-induced calcium release (CICR) (Catterall, 2011; Clapham, 2007). The pore-forming α1 subunits of VGCCs are classified into L-type, N/P/Q-type, and T-type subgroups. Previous studies have demonstrated the requirement for EGL-19 and/or UNC-2, the sole orthologs of L- and N-type channels, respectively, in the responses of sensory neurons of C. elegans (Busch et al., 2012; Frøkjaer-Jensen et al., 2006; Hilliard et al., 2005; Kato et al., 2014; Larsch et al., 2015; Suzuki et al., 2003; Zahratka et al., 2015) although their precise roles in intracellular calcium dynamics have remained unclear. We found that an egl-19 reduction-of-function mutation (rf) (Lee et al., 1997) significantly affected the AWB response (Figure 7A). Consistently, treatment with the EGL-19 antagonist Nemadipine-A (NemA) (Kwok et al., 2006) exhibited a similar, or possibly even stronger, effect. In contrast, mutations in unc-2, itr-1 (the IP3R ortholog) or unc-68 (the RyR ortholog) (Dal Santo et al., 1999; Sakube et al., 1997; Schafer and Kenyon, 1995) did not significantly affect the response (Figure 7A and C left panel). These results suggest that the calcium accumulation in AWB neurons mostly depends on influx through the EGL-19 L-type VGCCs, but not other calcium channels. Calcium channels are involved in the dynamic regulation of [Ca2+]i in a cell type-dependent manner. (A and B) Responses of AWB (panel A) or ASH (panel B) neurons in strains with genetic and/or pharmacological suppression of N/P/Q-type VGCC UNC-2, T-type VGCC CCA-1, L-type VGCC EGL-19, IP3R ITR-1, and RyR UNC-68. lf is a loss-of-function mutation, and rf is a reduction-of-function mutation. Note that loss-of-function mutations of egl-19 and itr-1 are not available due to possible lethality. (C) Suppression of the AWB response during the odor-down phase (left) and of the initial ASH response (10–15 s of the odor-up phase) (right) with the genetic mutation (M) and/or the drug treatment (D). ***p<0.001 (Kruskal-Wallis test with post hoc Steel-Dwass test). (D) egl-19 is also responsible for the slow time-integral component in ASH neurons. Addition of a putative time-integral response using the leaky integrator equation to the transient response in the ‘egl-19(drug)’ reproduced the ASH response of the naive wild-type animals. Black line: wild-type response shown in panel B; black dashed line: egl-19(drug) response in panel B; red dashed line: the time-integral model of positive dC/dt; red line: sum of the black and red dashed lines. The parameters are described in Table 1. All the statistical details are shown in Supplementary file 1. In ASH neurons, whose response pattern was also not affected by synaptic connections (Figure 7—figure supplement 1), the suppression of EGL-19 with NemA mainly affected the later phase of the response, but did not significantly affect the initial response (Figure 7B and C right panel). The mathematical addition of the AWB-like time-integral response to the NemA-treated ASH response resembled the wild-type ASH response (Figure 7D), suggesting that the ASH response consists of both fast and slow components. Because increases in the turning rate occurred at the onset of the odor-up phase (Figure 4A), the fast component may have a major influence on the behavioral response. This fast component was not affected by a loss-of-function mutation in unc-2 or in a T-type VGCC homolog, cca-1 (Steger et al., 2005), suggesting that this calcium response is not mediated by the typical VGCCs. Suppressing CICR by mutations of itr-1 or unc-68, or using dantorolene, a RyR antagonist (Krause et al., 2004), partially affected the magnitude, but not the temporal pattern, of the ASH response regardless of NemA treatment (Figure 7B and C right panel). Taken together, these results suggest that the ASH response may be mediated by rapid calcium influx via an unidentified type of calcium channels and by slow influx via EGL-19 L-type VGCCs, both of which are amplified by CICR. In previous studies, ASH response was significantly suppressed by NemA-treatment as well as by the egl-19(n582) mutation upon stimulation with another repulsive odorant (1-octanol) (Zahratka et al., 2015) although ASH response was essentially unaffected by the same egl-19 mutation upon stimulation with glycerol (Pokala et al., 2014), suggesting that different sensory stimuli may be processed differently in the polymodal ASH neurons. 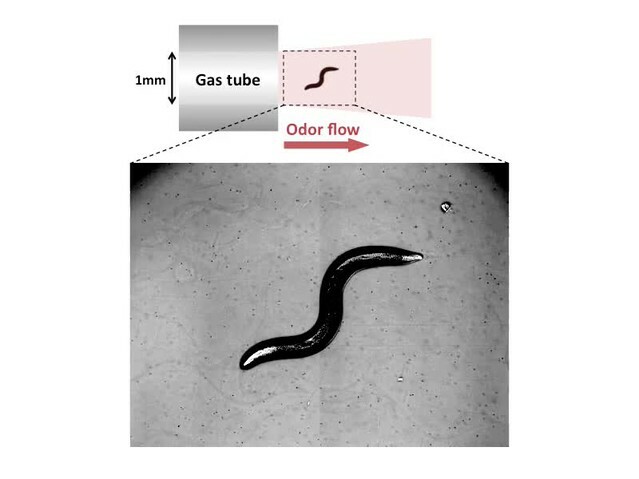 In this study, we quantitatively analyzed olfactory behavior in C. elegans and found that the animals appear to choose the appropriate migratory direction efficiently on the gradient of a repulsive odor based on subtle changes in odor concentration. This result suggests a novel behavioral strategy for navigating sensory gradients (Figure 1E). One of the problems in analyzing animals' responses in a traditional behavioral arena is that the behavior of animals occurs in a closed loop configuration, i.e., the change in movement directly feeds back onto sensory input. Therefore, when the changes in sensory stimulus and behavior are simultaneously observed, it is difficult to distinguish whether sensory input or behavior is the cause of the change. To solve this problem, we established a rigorous quantitative platform to understand the sensory behavior of C. elegans: We measured the temporal changes in sensory stimulus in a traditional behavioral paradigm and reproduced it in an integrated microscope system (the OSB2 system) in an open loop configuration. This made it possible to quantitatively measure behavioral responses caused by sensory stimuli, and the neural activities mediating them. Based on the results obtained in our system, we consider that the olfactory behavior of the animals comprises two essential features of decision-making at the behavioral level. (1) Discrete behavioral choice based on sensory information: Based on dC/dt, C. elegans choose either a high-turning state (pirouette) or low-turning state (run), which were shown to be physiologically distinct (Figure 2D and Figure 1—figure supplement 1A and E). (2) Timing of decision: The time required for the transition from a high-turning state to a low-turning state is shorter when the odor concentration decreases rapidly, and is longer when the concentration decreases slowly (Figure 4B). Moreover, we found that [Ca2+]i is accumulated in AWB neurons according to a leaky integrator equation of odor concentration change, which is correlated with the behavioral transition (Figure 4B and Figure 4—figure supplement 2). Because odor concentration is a critical piece of information for the choice of behavioral states, the temporal integration in AWB neurons can be regarded as the ‘evidence accumulation’ for decision-making. The behavioral transitions in 2-nonanone avoidance are regulated by ASH neurons for odor increase and AWB neurons for odor decrease (Figure 8A). ASH neurons respond to unfavorable changes in the odor concentration in a time-differential manner and initiate turns rapidly. Such a ‘reflex’-like response is consistent with the nociceptive features of ASH neurons and their synaptic connectivity, whereby the animals respond to various noxious stimuli by inducing turns and reversals (Bargmann, 2006; Kaplan, 1996). Time-differential properties have been suggested for the transient responses of ASH and other sensory neurons with all-or-none stimuli in C. elegans (Lockery, 2011). This property has also been reported in a recent study of Drosophila olfactory neurons (Schulze et al., 2015) and is in agreement with the general idea that dynamic signal changes are mediated by phasic sensory receptors (Delcomyn, 1998). Mathematically, the ASH activity can also be approximated by the same leaky integrator equation as AWB, whose fitness is higher than the time-differential equation according to the Bayesian Information Criterion (BIC) (Figure 4—figure supplement 3 and Table 3). This is consistent with the recent report that ASH neurons temporally integrate sensory signals over several seconds (Kato et al., 2014). However, the onset of responses was not sufficiently reproduced with the model (Figure 4—figure supplement 3, red arrows). Our result in Figure 7D suggests that the ASH response consists of the time-integral component mediated by EGL-19 L-type VGCCs and the fast and transient component, possibly mediated by as-yet-unidentified channels. Nociceptive ASH neurons may have developed specialized mechanisms to quickly cause aversive responses based on a slight change in the undesirable signal. Physiological and molecular models of decision-making by C. elegans during odor avoidance. (A) Computations of ASH and AWB neurons during odor avoidance behavior. (B) Model of the molecular mechanisms for temporal computation of odor information in AWB and ASH neurons. (Left) In AWB neurons, odor decreases likely cause the activation of Gα proteins as an odor-OFF response (Bargmann, 2006; Usuyama et al., 2012), where an unidentified Gα positively transduces the signal and ODR-3 inhibits the signal for the time-differential computation. The Gα signaling is transmitted to the cGMP-gated cation channel TAX-2/TAX-4 (Bargmann, 2006) to cause depolarization. Depolarization then triggers calcium influx via EGL-19 at the cell body, which causes the gradual accumulation of [Ca2+]i. (Right) In ASH neurons, the depolarization at the sensory ending triggers an unidentified rapid and transient calcium channels, as well as EGL-19. The calcium influx through these channels is amplified by CICR via RyR (UNC-68) and IP3R (ITR-1). In contrast, AWB neurons extract long-term information about favorable changes in odor concentration using the time-integral property, which leads to ‘deliberate’ transitions from pirouettes to runs. This time-integral property has not been characterized previously in the sensory response of C. elegans. The sensory responses of the animals to gradual signal changes have been reported in a few cases, although they were time-differential, stochastic or tonic, rather than time-integral (Biron et al., 2008; Kimura et al., 2004; Luo et al., 2014). In reality, sensory signals likely change with noise rather than at a constant rate. Moreover, an animal's movement itself causes fluctuations in the sensory input. Thus, it is reasonable to conclude that animals extract sensory information over a longer time window by using a time-integral property, such as that described here for AWB neurons. To trigger behavioral transitions according to neuronal activity, a threshold for temporal integration is required. AIZ interneurons, the major postsynaptic targets of AWB neurons (White et al., 1986), have been shown to elicit digital-like excitability and trigger turns upon activation (Li et al., 2014), suggesting that AWB neurons inactivate AIZ neurons in an all-or-none manner at a certain threshold. Through genetic analyses, we investigated the molecular mechanisms underlying the computations in AWB and ASH neurons. First, we found that the temporal integration of sensory information occurs within the AWB neuron itself and is not dependent on synaptic connections. To the best of our knowledge, this result is the first experimental demonstration of evidence accumulation for decision-making within a neuron (see below). 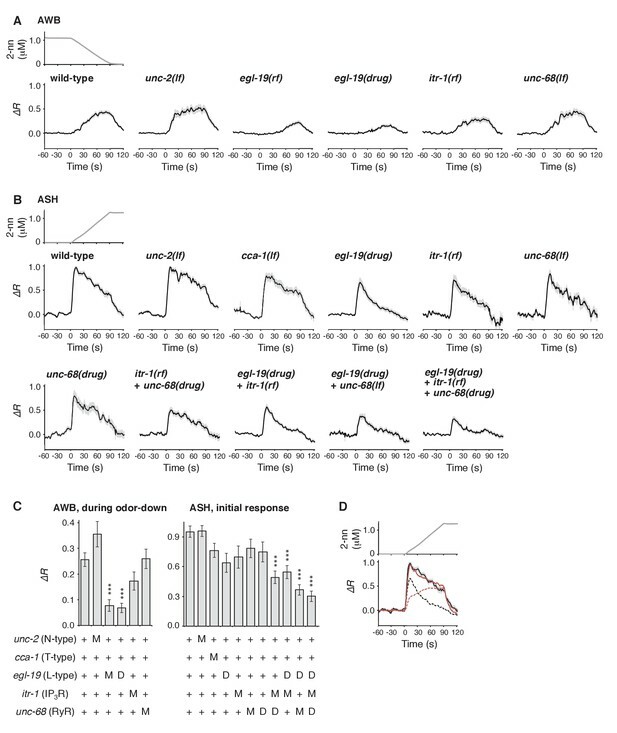 We also found that the ODR-3 Gα protein possibly plays a time-differential role in the sensory signaling of AWB neurons. The result was surprising because ODR-3 has been considered to play a major stimulatory role in sensory signal transduction, not in its inhibitory modification (Bargmann, 2006; Roayaie et al., 1998). Because ODR-3 is homologous to the inhibitory Gαi proteins (Bargmann, 2006), it is possible that the sensory signal via another unidentified Gα might be downregulated by the activity of ODR-3—such an inhibitory feed-forward loop could compute the time-differential of the input (Figure 8B, left) (Alon, 2007). In ASH neurons, ODR-3 appears to transduce the sensory signal itself (likely with other Gα); the different roles of ODR-3 in AWB and ASH neurons may be related to the fact that AWB and ASH neurons use different molecular pathways for signal sensation (Bargmann, 2006). Together with the finding that the time-integral calcium increase in AWB neurons is mainly mediated by EGL-19 L-type VGCCs, these results suggest the following model (Figure 8B, left). A constant change in odor concentration leads to a constant and persistent depolarization with a time-differential activity of ODR-3 Gα at the sensory ending. This depolarization is conducted to the cell body and causes the constant activation of EGL-19 L-type VGCCs and the constant influx of extracellular calcium, which leads to the gradual accumulation of [Ca2+]i. In agreement with this model, L-type, but not N/P/Q-type or T-type, VGCCs are known to be activated continuously during depolarization (Hille, 2001). This gradual [Ca2+]i accumulation causes a temporal delay and deliberate decision, acting as a low-pass filter to smooth out noisy sensory inputs. By contrast, in ASH neurons, the depolarization causes the activation of EGL-19 L-type VGCCs and other type(s) of rapid and transient calcium channels, where a small influx of calcium leads to its amplification with CICR and to a rapid behavioral response (Figure 8B, right). In principle, temporal integration of sensory information for behavioral choice in C. elegans during odor avoidance is analogous to evidence accumulation in perceptual decision-making in mammals. In both cases, animals extract a long-term trend in sensory information by temporally integrating the information for decision-making (Gold and Shadlen, 2007; Schall, 2001). While AWBs are sensory neurons, their integration property may reflect a central nervous system-like function; C. elegans' sensory neurons are known to possess higher-order functions, such as learning and memory, because of the quite small number of neurons in their nervous system (de Bono and Maricq, 2005; Sasakura and Mori, 2013). In higher animals, temporally integrating neural activity is required for decision-making as well as for other brain functions, such as working memory, and is generally considered to be mediated by recurrent neural circuits (Gold and Shadlen, 2007; Schall, 2001; Wang, 2008). This temporally integrating activity has also been suggested to be mediated by intracellular calcium signaling within a cell (Curtis and Lee, 2010; Loewenstein and Sompolinsky, 2003; Major and Tank, 2004); however, this had not been demonstrated experimentally. We speculate that single-cell temporal integrators with L-type VGCCs, such as the AWB neurons, may also be involved in decision-making and working memory in higher animals. Interestingly, the odor avoidance behavior of C. elegans is regulated by dopamine (Kimura et al., 2010), a neuromodulator involved in mammalian decision-making (Schultz, 2007). Thus, further genetic analysis of the behavioral choice during odor avoidance behavior in C. elegans may identify previously undescribed evolutionarily conserved molecular mechanisms that are responsible for decision-making. The techniques used for culturing and handling C. elegans were essentially as described previously (Brenner, 1974). The C. elegans wild-type Bristol strain N2, RRID:WB-STRAIN:JD21 cca-1(ad1650), RRID:WB-STRAIN:MT1212 egl-19(n582), RRID:WB-STRAIN:JT73 itr-1(sa73), RRID:WB-STRAIN:CX3222 odr-3(n1605), RRID:WB-STRAIN:CX2205 odr-3(n2150), RRID:WB-STRAIN:CB55 unc-2(e55), RRID:WB-STRAIN:MT7929 unc-13(e51), RRID:WB-STRAIN:DA509 unc-31(e928), and RRID:WB-STRAIN:CB540 unc-68(e540) were obtained from the Caenorhabditis Genetics Center (University of Minnesota, USA). In all the behavioral and physiological experiments, young adult hermaphrodites were used. Quantitative analysis of the 2-nonanone avoidance of wild-type animals in the 9 cm agar plate was carried out as previously described (Kimura et al., 2010; Yamazoe-Umemoto et al., 2015). In brief, several adult animals per assay were transferred to the center of a 9 cm NGM agar plate either directly from a standard 6 cm nematode growth medium (NGM) plate with the food bacteria OP-50 (‘fed’) or after a 1 hr starvation on the NGM plate without OP-50 (‘starved’). In the following analysis, we used a data set that is a mixture of 50 fed and 50 starved animals. Although we did not find a significant difference between fed and starved animals in 2-nonanone avoidance (Kimura et al., 2010), the feeding state (fed or starved) could affect some aspects of C. elegans' behavior (Bargmann, 2006) and we wanted to focus on feeding state-independent behavioral aspects of the animals. Two μL of 30% 2-nonanone (diluted in EtOH) were put in two spots on the surface of the agar plate (Figures 1A and 2A), and images of the animals during the avoidance behavior were captured at 1 Hz for 12 min by our multi-worm tracking system with a high-resolution camera in a fixed position (Kawazoe et al., 2013; Yamazoe-Umemoto et al., 2015). In this study, we used a CMOS camera CSB4000F-10 (Toshiba Teli Corp., Japan) equipped with a C mount adaptor and a Nikkor 50 mm f/1.2 lens (Nikon Corp., Japan). Because the camera captures the entire area of the 9 cm plate with a resolution of 2008 × 2044 pixels, an animal of length ~1 mm and width ~0.05 mm is depicted in ~25 pixels. x−y coordinates of the centroids of the animals in each image were measured by Move-tr/2D software (Library Inc., Japan), and were further analysed by Excel2010 (Microsoft) or R (The R Project). Because the animals did not initiate avoidance during the first 2 min on average (Kimura et al., 2010) (Figures 1A and 2B and Figure 2—figure supplement 1E), data between 121–720 s were used for the analysis (Tanimoto et al., 2017). A pirouette is a period of frequent turns and migrations whose duration is shorter than a threshold value (Pierce-Shimomura et al., 1999). The animal's behavioral state in one second was classified as a turn if the absolute value of angle change in migratory vector of the animal's centroid from the previous second (i.e., during 1 s) was larger than 90° or if the migratory velocity was smaller than 0.1 mm/s in the following frames after the large angle change. According to this definition, the reverse and the omega turn (Gray et al., 2005) were recognized as turns. A distribution of turn intervals (i.e., migratory durations) during 2-nonanone avoidance was well-fitted by a sum of two exponentials for shorter and longer intervals (Figure 1—figure supplement 1A). A period at which the numbers of the short and long intervals were equal was 13.1 s and determined as tcrit according to the original definition (Pierce-Shimomura et al., 1999). Migrations whose turn interval was longer than tcrit were classified as runs, and migrations shorter than tcrit as well as turns were classified in pirouettes. The directions of animal migrations for 1 s were defined in terms of the bearing, B, with respect to the 2-nonanone gradient, where B = 0° indicates migration directly away from the odor source (i.e., down the gradient) and B = ±180° indicates migration directly toward the odor source (i.e., up the gradient). Bearing at run initiation in salt-taxis by the previous study was calculated from the results of taxis toward NH4Cl (56.0%) and biotin (55.2%) in Figure 9 of the report (Pierce-Shimomura et al., 1999). Calibration curve for 2-nonanone measurement is described in more detail at Bio-protocol (Yamazoe-Umemoto et al., 2018). To measure local concentrations of gaseous 2-nonanone in the assay plate, we used a gas chromatograph (GC) with a sensitive semiconductor detector, SGVA-N2, which was optimized for 2-nonanone detection (FIS Inc., Japan). To make a calibration curve for the measurement, 0.36, 1.07, 3.56, 35.6, 59.4, 97.2, and 200 μL of liquid 2-nonanone (Wako Pure Chemical, Japan) were vaporized in a 50 L tank DT-T1 (FIS Inc.), each corresponding to 0.04, 0.12, 0.4, 4.0, 6.8, 11.1, and 22.9 μM in the gas phase, respectively. After the volatilization period, 0.2 mL of the gas was sampled with a 2 mL plastic syringe with a needle from an outlet of the tank and was immediately injected into the GC. The volatilization periods were determined for each amount of the liquid to maximize the 2-nonanone signal. Synthetic air Alphagaz 1 (Air Liquide, Japan) was used as a carrier gas. With 260 s retention time, a single large peak of signal intensity (mV) was detected as 2-nonanone signal (Figure 2—figure supplement 1B). The experiments were repeated 3–4 times for each concentration. The correlations between the peak height of the signal and the gaseous 2-nonanone concentration in a log-log plot were well-fitted by two simple regression lines for lower and higher concentrations (Figure 2—figure supplement 1C; R2 >0.999 for both). In general, for semiconductor detectors, the correlation between the peak height of the signal and signal concentration in a log-log plot are well-fitted by two simple regression lines for lower and higher concentrations. Measuring odor gradient by gas chromatograph is described in more detail at Bio-protocol (Yamazoe-Umemoto et al., 2018). For the odor sampling, a hole of 1 mm in diameter was made through the bottom of the plastic plate and the agar. Because the molecular weight of 2-nonanone (FW 142.2) is larger as a volatile compound, it did not leak easily from such a small hole. 1, 3, 6, 9 and 12 min after placing the odor at the two spots, a 2 mL plastic syringe, which is the same type as the one used in the calibration, was inserted into the plate through the hole from the bottom, and 0.2 mL of the gas phase was sampled (Figure 2—figure supplement 1A). Each plate was used only once to avoid disturbance of the gradient by the sampling. The sampled gas was immediately injected into the GC for measurement. The concentration of 2-nonanone was calculated from the height of the signal peak according to the regression line for the calibration. For each data point, the measurements were repeated 7–9 times and median and quartile was calculated for the fitting. Fitting the odor gradient and calculation of Cworm are described in more detail at Bio-protocol (Yamazoe-Umemoto et al., 2018). The least squares method was used to fit the measured concentration. In the closed plate, the odor concentration asymptotically approaches a constant value. Therefore the measured concentrations were fitted to a phenomenological curve with two exponential saturation functions: C(x, y, t) = a(r1)(1-exp(-b(r1)t)) + a(r2)(1-exp(-b(r2)t)). r1 and r2 are the distances from the position (x, y) on the agar to the two odor sources. The asymptotic concentration a(r) and the increasing rate b(r) are functions of the distance r such as a(r)=a0 exp(-a1r - a2r2) and b(r)=b0 exp(-b1r - b2r2). The assumption that C(x, y, t) is given by the sum of the two independent functions is valid for the low concentration regions x > 0. The fitting parameters a0 = 20.68 μM, a1 = 0.7355 cm−1, a2 = −0.05408 cm−2, b0 = 0.8384 min−1, b1 = 0.7835 cm−1 and b2 = −0.05761 cm−2 were determined by the Levenberg-Marquardt method (Press et al., 1992). We consider the measured and the fitted odor gradient as reliable because it is consistent with the fact that the amount of 2-nonanone at the source was apparently reduced by 20–30% after 12 min and with a theoretically calculated simulation (Yamazoe-Umemoto et al., 2015). The 2-nonanone concentration at a given temporal and spatial point of an animal’s centroid was calculated from the fitting curve and was designated as Cworm. Turning rate shown in Figure 2D was determined as the relationship between the dCworm/dt during one second of migration and the probability of turning in the next second. For the cell-specific expression of mCherry (Shaner et al., 2004), GCaMP3 (Tian et al., 2009), ChR2(C128S) (Berndt et al., 2009) and Arch (Chow et al., 2010), str-1 (Troemel et al., 1997) or srd-23 promoter (Colosimo et al., 2004) was used for AWB-expression, and sra-6 promoter (Troemel et al., 1995) was used for ASH-expression. Germline transformation was performed using microinjection (Mello et al., 1991). The plasmids and strains used in this study are listed in Supplementary file 2 and 3. In Figures 3, 4 and 6B and Figure 6—figure supplement 1, multiple transgenic lines were used for each type of experiment, and the different lines produced similar results. The representative transgenes (i.e., extra chromosomal arrays) were used for genetic analyses in Figures 6A and 7. For the OOSaCaBeN (Olfactory and Optogenetic Stimulation associated with Calcium imaging on Behaving Nematode, or OSB2) system, we integrated an auto-tracking microscope system for calcium imaging and optogenetic manipulation with an odor-delivery subsystem (Busch et al., 2012; Tanimoto et al., 2016). Briefly, a wild-type C. elegans (N2) on a NGM plate was placed on a motorized stage HV-STU02 (HawkVision, Japan) combined with an upright microscope and illuminated with infrared light. Bright field images of the animal were acquired by a charge-coupled device (CCD) camera at 200 Hz to regulate the motorized stage for maintaining the region-of-interest (ROI) of a freely moving animal in the center of the view field of the microscope (‘ROI-tracking’, Video 2) (Maru et al., 2010). A ROI was set around the head neuropil. The system also allowed us to maintain the centroid of a whole animal in the center of the view field (‘centroid-tracking’, Video 4). 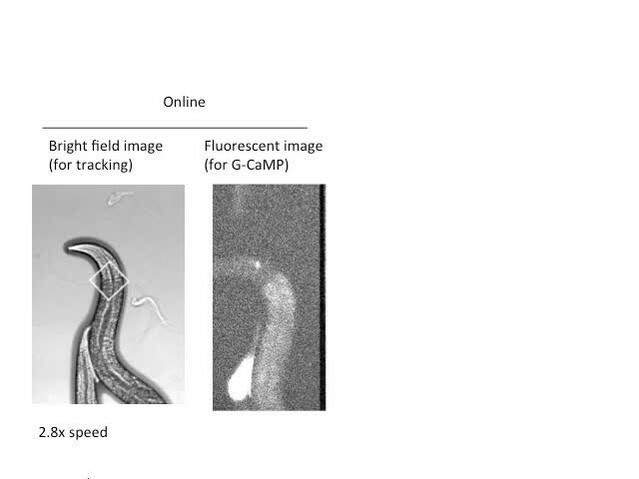 ROI-tracking was used for calcium imaging with a 20× objective lens, and centroid-tracking was used for wild-type behavioral analyses and optogenetic behavioral analyses with a 10× objective lens. The behaving animal was continuously exposed to an odor flowing from two syringe pumps (Video 3), which changed the odor concentration according to a predefined program. For odor delivery, 4 μM of 2-nonanone was sampled from the 50 L vaporizing tank with a 25 ml Gastight Syringe (Hamilton, USA). Two such syringes were set on a syringe pump HV-SSP01 (HawkVision, Japan) that was controlled by the same program for the auto-tracking. Adapting the gas delivery strategy described previously (Busch et al., 2012), one pump was used for 2-nonanone and the other one was for air. The pump speeds were programmed to deliver a constant gas flow of 8 mL/min from the end of the tube, but with varying combinations from each pump to make the temporal gradient of 2-nonanone concentration. For example, when the pump speed of 2-nonanone syringes was changed from 2 ml/min to 5 ml/min, the air syringes went from 6 ml/min to 3 ml/min during the same period. The programs of the pump speeds were designed so that the magnitude of dC/dt was similar to that which animals experienced during the odor avoidance assay in the plate (Figure 2). The actual concentration of 2-nonanone was monitored at the end of the tube by the same type of semiconductor sensor as the one in the gas chromatograph (GC), and the values were recorded with a PC via a digital multimeter MAS345 (Mastech, Hong Kong) before and after the behavioral assays for each day. The sensor was calibrated every day with a similar method as the GC, with calibration concentrations of 0.5, 1, 2, and 4 μM. We consider that the measured odor concentrations (Figures 3, 4, 6 and 7) closely matched to the actual odor concentration that the animals experienced during the odor avoidance behavior (Figures 1 and 2) because of the following reasons. (1) The tube end was always maintained at ~1 mm from the freely-moving animal during tracking, and the entire body of an animal was exposed to essentially uniform odor flow without significant diffusion and/or turbulence (Figure 3—figure supplement 1A and Video 3). (2) With the flow (8 ml/min), the animals exhibit robust behavioral response reproducibly through multiple trials (Figures 3 and 4) while the flow itself did not affect the animal's behavior. (3) The animals likely sense the odor concentration in air phase but not in water phase (i.e., agar surface) because of the high hydrophobicity of 2-nonanone (a nine carbon ketone). The behavior of animals was calculated from records of displacement of the auto-tracking stage and from the position of the ROI or centroid of the view field. For ROI-tracking, the trajectory of an animal’s behavior was wavier than for centroid tracking because the ROI was usually set around the animal's head, which moves in a sinusoidal pattern (Video 2). To compensate for the wavy pattern, the x−y coordinates for ROI-tracking were calculated as a moving-average for ±10 frames at 10 Hz (i.e., ±1 s). This gave similar results to centroid-tracking on the quantitative behavioral analysis. The migratory trajectory from either of the tracking methods was sampled at each second (1 Hz), and a change in the migratory vector for 1 s larger than 90° was recognized as a turn. In the Figures, ensemble averages in each 10 s bin are shown. where x¯ is the sample mean, n is the number of previously observed data, tα/2,n−1 is the 100(1-α/2) percentage point of a t-distribution with n−1 degrees of freedom, and s is the sample standard deviation (Montgomery and Runger, 2002). Using this criterion, we analyzed ‘timing when the unexpected value appears for the first time’ in Figure 4A and B. The details of calcium imaging with the OSB system were previously described (Tanimoto et al., 2016). In brief, the sample was exposed to excitation light from a MiLSS (Multi-independent Light Stimulation System, Aska Company, Japan) (Sakai et al., 2013). The images for GCaMP and mCherry were split and simultaneously captured side-by-side on an EM-CCD camera ImagEM with W-View system (Hamamatsu, Japan). Images were taken at a 32.6 ms exposure time and 100 ms sampling interval with 2 × 2 binning. The cell body was tracked off-line with another custom-made program for the centering (Video 2), and signal intensities of particular regions were measured by ImageJ (NIH). The data from frames where the cell body was not centered were omitted. The signal intensity of the background was subtracted from that of the cell body, and the value was moving-averaged for ±1 frames and further analysed. The average of fluorescence intensity of GCaMP during 1 min before the odor increment or decrement was defined as the baseline F0. Because ∆F/F0 of GCaMP and the ratio between fluorescence intensities of GCaMP and mCherry (GCaMP/mCherry: R) exhibited similar tendencies, and because and the noise level was smaller in ∆F/F0 than in R, the data of ∆F/F0 were used in the figures. In Figure 7, ∆R was used because the mutations in itr-1 or unc-68 could affect the baseline as well as the response calcium levels of the neurons. Also in Figure 7, the animals were immobilized with the acetylcholine receptor agonist levamisole for high-throughput analysis, in which multiple animals were stimulated and imaged simultaneously. Even with the levamisole treatment, the responses of AWB and ASH neurons in the naive wild-type animals were essentially similar to those in the freely moving animals (Figure 4A and B). Animals were raised in the presence or absence of ATR according to the previous report (Kawazoe et al., 2013), and transferred to an NGM plate on the OSB2 system and maintained under the objective lens by auto-tracking. For ChR2(C128S) experiments in the absence of a 2-nonanone stimulus (Figure 3D), after 1 min without light stimulation, the animal was transiently illuminated with blue light (3 s) for activation through BP460-495 and DM505 with ND25 (~0.8 mW/mm2). Turning rates of 30–60 s and 65–95 s were calculated as before or after the blue light illumination, respectively. The turns of 60–65 s were not included in the calculation because blue light illumination (60–63 s) appeared to somewhat affect the animals’ locomotion for a few seconds (Ward et al., 2008). For Arch experiments in the presence of a 2-nonanone stimulus (Figures 3F and 4C), green light was delivered through BP530-550 and DM570 at ~1.0 mW/mm2, and turning rates were calculated. The optical filters were from Olympus. where X(t) is neuronal response, k is the conversion factor, and C(t) is the measured odor concentration. The dC(t)/dt was calculated as the central difference of C(t). This equation indicates that the neuronal response X(t) responds to the odor gradient dC(t)/dt at each time. The value of k was determined by the least squares method to fit X(t) to the measured ΔF/F0 in response to the odor gradients. where external input was given by temporal odor change; I(t)=dC(t)/dt. τ is the time constant of leaky integration. k and τ were determined by the least squares method to fit X(t) to the measured ΔF/F0 responded to the odor gradients. This differential equation was numerically integrated by the Euler method with a time-step of 1 s. The initial value was X(t) = 0 which corresponds to ΔF/F0 = 0 in the basal state. For odr-3 mutants, on the other hand, external input was I(t)=−(C(t)−C(t−Δt))/Δt in the leaky integrator equation, and the values k,τ, and Δt were determined to fit X(t) to the measured ΔF/F0 of odr-3. where Xbase corresponds to the basal calcium concentration in the steady state and takes a positive value. For AWB and ASH neurons, unknown model parameters k,τ,fmin and Xbase were determined by the least squares method to fit X(t) calculated by the generalized leaky integrator equation to the calcium concentrations estimated from ΔF/F0. Similar estimation of non-linear property of GCaMP3 has been reported previously (Kato et al., 2014). The time-differential and time-integral models reasonably approximated the neural responses under the conditions used in this study. However, with stronger odor concentration changes, input saturation may need to be considered, in which case the input could be put through a logistic sigmoid function for example. The values of the fitting parameters are shown in Tables 1, 2, 3 and 4. The previous algorithms (Iino and Yoshida, 2009; Yamazoe-Umemoto et al., 2015) were modified as follows to simulate 2-nonanone avoidance behavior (Figure 5). The parameters for simulation were based on the migratory statistics of real wild-type animals and contained no free parameters unless otherwise indicated. The model animal moved at a speed of 0.14 mm/s. In the low-turning state, the model animal moved forward with fluctuations in migratory direction, which was randomly chosen from the Gaussian distribution of −0.065 ± 5.14° (mean ± SD). The odor signal periodically fluctuated because of the sinusoidal movement of the animal. The position of animal’s anterior end, where the sensory endings of ASH and AWB neurons are located, was calculated as a sine curve along the animal’s track. The amplitude and frequency of the sine curve was 0.1 mm and 0.5 Hz, respectively (Kimura et al., 2004; Shen et al., 2012). The track of the anterior end was used for the calculation of Cworm. A turn occurred based on the pirouette initiation rate of 0.0326/ (0.200 + exp(−231 ×dC/dt))+0.0260, which is relatively constant (~0.03 s−1) when dC/dt <0 and increases when dC/dt >0; The dC/dt-dependency in the pirouette initiation rate was determined from the probability of pirouette initiation after 2 s of the step for real animals. The turning duration was 3 s. After a turn, the model animal was in the high-turning state and initiated a migration, whose deviation in direction from the direction just before the turn was randomly chosen from a pool of the measured values in real animals. In the high-turning state, the model animals turned at a constant rate of 0.2 s−1, which results in ~95% of migratory duration shorter than the threshold value tcrit (13.1 s). Therefore, in the high-turning state, most of the migrations were classified as pirouettes. When the model animals happened to migrate down the gradient and experienced dC/dt <0, their state transited from high- to low-turning according to the leaky integration of dC/dt described in the previous section. When the leaky integration of dC/dt became higher than 0.18, the high turning state was switched to the low turning state. The threshold value 0.18 was chosen as a value similar to the one associated with the turn suppression in Figure 4B. For the ‘differentiation model,’ dC/dt itself was used for the initiation of a low turning state instead of leaky integration, and the high turning state was switched to the low turning state when dC/dt was negative. The simulation was repeated 100 times for each model animal condition. Time was discretized into intervals with ∆t = 1 s.
For the experiments with the OSB2 system, the data were obtained on multiple days from approximately 20–50 animals for each condition. We chose this sample number because a large scale behavioral analysis of C. elegans concluded that 20 animals would discriminate single SD in a behavioral phenotype at over 80% power, and 24 ± 14 (average ± SD) animals per condition were used in the study (Yemini et al., 2013). For Figures 1 and 2 and Figure 1—figure supplements 1, 100 animals were used because we investigated various aspects of behavior in detail. After the sample acquisition, the data of some animals for Figures 3, 4, 6 and 7 were excluded when any of the following problems were found: (1) trials interrupted by errors in auto-tracking, (2) animals with too weak intensity of basal mCherry or GCaMP3 fluorescence for off-line tracking, (3) animals with abnormal sudden transient activation of AWB during odor-zero or odor-up phases (8 out of 279 animals tested for AWB), or (4) animals with basal locomotion speeds slower than 0.02 mm/s (average speed ± SD of normal animals was 0.15 ± 0.04 mm/s). Experimental conditions, such as the presence/absence of ATR, light stimulation, odor gradient, or different strains were randomized on a daily basis. A Kruskal-Wallis test with a post hoc Steel-Dwass test was used for multiple comparisons in Figures 3B, 4A, B and 7C, while a Mann-Whitney test was used for single comparison in Figures 1D, 3D, F and 4C, and Figure 2—figure supplement 1D (right panel) using R (The R Project) or Prism ver. 5.0 for Mac OSX (GraphPad Software, San Diego, CA). The Mardia-Watson-Wheeler test was used for Figure 5C and Watson's U2 test was used for Figure 3—figure supplement 1B by using Oriana ver. 3 (Kovach Computing Service, Wales, UK). All the statistical details are shown in Supplementary file 1.
where N is the number of samples (frames) used for the fitting, RSS is the residual sum of squares obtained from fitting by the least squares method, and M is the number of free parameters in a given model, respectively. M = 1 for the differentiation model (k), M = 2 for the leaky integration model (k, τ), and M = 3 for the leaky integration model for odr-3 (k, τ, ∆t). The lower BIC value means a better fitting with a model. Cold Spring Harbor Perspectives in Biology 3:a003947–23. Annual Review of Neuroscience 28:1–501. 209–231, Properties of Sensory Systems, Foundations of Neurobiology, New York, W H Freeman & Company. Voltage-Gated Calcium Channels, Ion Channels of Excitable Membranes, Sunderland MA, Sinauer. Current Opinion in Neurobiology 6:494–499. IEEE/SICE International Symposium on System Integration. Journal of Molecular Biology 267:849–864. Current Opinion in Neurobiology 23:92–99. Journal of Experimental Biology 208:2191–2203. Thank you for submitting your article "Calcium dynamics regulating the timing of decision-making in C. elegans" for consideration by eLife. Your article has been reviewed by three peer reviewers, and the evaluation has been overseen by a Reviewing Editor and Eve Marder as the Senior Editor. The reviewers have opted to remain anonymous. As you see from the attached reviews, all reviewers find your study of interest, but raised a number of critiques ranging from genetics to modeling. We hope that you will be able to address these critiques in a revised manuscript in the next few months. You should scale back your molecular-level conclusions where evidence is not definitive. We look forward to receiving your revised manuscript. In this study Tanimoto et al. address how sensory information is encoded by neurons to implement behavioral decisions. The authors developed new experimental setups and using these approaches provide an interesting conceptual framework linking sensory neural activity to behavior. More specifically, based on their behavioral data they propose a novel negative chemotaxis strategy during which animals accumulate sensory evidence prior to a behavioral decision, switching from a pirouette to a forward-run behavioral state. By calcium imaging they show that AWB chemosensory neuron responses, in contrast to ASH nociceptive neurons, can be fitted to a leaky-integrator model, which could be an essential feature of the evidence-accumulation mechanism. They substantiate this finding with a computer simulation of chemotaxis. Investigating the molecular basis for the temporal integration of olfactory stimuli in AWB, they first confirm that the integration is a cell autonomous property of AWB. They then show that the odr-3 Ga protein is essential for the response property of the neurons. Furthermore, they show that the calcium accumulation in AWB and ASH can be attributed to L-type Ca VG calcium channels, and not to B-type, thought there must be other components in ASH, as only the late response phase is affected. This manuscript could present both a technical and conceptual advance showing for the first time that evidence accumulation for decision making can be performed by a single sensory neuron class, including an underlying molecular mechanism, as opposed to circuit mechanisms proposed by work in higher animals. However, I think not all conclusions are sufficiently supported in the present form and some experiments need more repetitions and appropriate statistical tests. The manuscript is well written and easy to follow with some exceptions that should be addressed in a revised manuscript (see below); the graphs are clear, supplemental data are appropriately provided. 1) Experiments in Figures 1–2 are performed in a closed loop configuration, i.e. movement directly feeds back onto sensory input. This is not the case for the open loop virtual gradient setup in subsequent experiments. This difference should be better addressed in the discussion text. 2) Figure 4A,B and E. I am not convinced that AWB and ASH sensory response profiles could not be fitted equally well to the alternative model in each panel. The authors should provide goodness of fit results for all models on each neuron dataset and perform appropriate statistical tests showing that one model performs significantly better than the corresponding null hypothesis model. 3) The authors use a threshold to determine when sensory information leads to an abrupt change in turning frequency. It is not sufficiently explained how exactly this 99%-prediction-interval is calculated. Provide more information in main text about the logic and details in Materials and methods section. 4) I am not convinced that the turning rate profiles in Figure 4A–B middle and right panels show discrete transitions. In Figure 4A-middle panel this is only supported by one data point (arrow). Otherwise, like in the right panel the trace increases gradually; but this is very difficult to judge because of the variability. Same in 4B-middle+right panels. The traces are gradually declining already prior to the onset of the odor down ramp. Moreover, the rates in 4A and 4B right panels are not found to remain consistently above/ below the threshold. I think these experiments require more repetitions, statistics and a no-odor-ramp control of the same larger dataset size. Otherwise the major conclusions of the paper are not sufficiently supported. 5) The differentiation between "reflex" and temporally delayed decision in up versus down ramp is not well founded in the given data. In fact, both responses in 4A vs 4B show very similar profiles, just with opposite signs. The difference is made mainly by the chosen thresholds. 6) The direct functional role of sensory information encoding in directional choice (as stated in the first sentence of the Discussion) is in fact never established due to the open loop configuration. This conclusion should be toned down. In this study the authors investigate the neural mechanisms underlying nonanone avoidance in C. elegans. Using behavioral tracking experiments, they find that, as previously shown for other types of worm chemotaxis, animals show a higher rate of turning when traveling in the aversive direction (here, toward higher repellent concentrations). In addition (and in contrast to salt chemotaxis), the authors find that following these reorientations the angle of bearing is biased away from the source of repellent. Through calcium imaging experiments, they correlate the increase in turn probability with the ASH sensory neurons, which show a rapid on response to nonanone increases, and the bias in run direction to the AWB neurons, which show a slow, "leaky integrator" off response to nonanone decreases. Finally, they analyze a number of signaling and ion channel mutants to explain molecular basis of these differing neural responses. 1) The genotypes in all the genetic experiments are poorly and incompletely documented. For example, the alleles used for egl-19, unc-68, unc-2, and itr-1 are not stated (at least I couldn't find them) and it is not stated how many times the strains were backcrossed. 2) From what I can tell, the authors only analyzed a single allele of each gene in question, and did not test whether any were rescued cell-specifically in the cells whose activity was measured. Since most of these genes are pan-neuronal or otherwise broadly expressed in the nervous system, it is not possible to reliably infer that they are functioning cell-autonomously in a particular neuron. Moreover, by only testing a single allele and not testing for rescue, it is not possible to even be sure the effect is due to the gene of interest as opposed to something else in the background. 3) Regarding the calcium channel mutants, the results in ASH are hard to reconcile with the results of Zarhatka et al., 2015. These authors showed that NemA completely blocked cell body calcium transients in ASH in response to a different odorant, octanol. Since presumably both octanol and nonanone are sensed in the cilium, it is hard to explain how the responses they induce could be conveyed to the cell body through different voltage-sensitive channels. Do the authors also see only a partial reduction in octanol response in their system? Is the fast initial response affected by the other (untested) VGCC gene cca-1? Also, the effect of the egl-19 reduction of function mutation is not shown in the figure. How does egl-19(lf) compare quantitatively with the supposedly complete block caused by NemA? Obviously it is not necessary for the authors' nonanone results to match Zarhatka's octanol results, but the differences are striking enough to merit further investigation. 4) I also thought the authors slightly overinterpreted the odr-3 results. odr-3 is expressed in many olfactory neurons besides AWB, so without cell-specific rescue it is a leap to infer cell-autonomy. Moreover, odr-3 mutants have been reported by Bargmann et al. to have abnormal cilium structure, so its effect may be of a developmental rather than a signaling nature. More generally, the nature of olfactory G-protein signaling is not well-understood in any C. elegans neuron, so inferring a specific role in signal integration on the basis of a single, unrescued allele (and without understanding the signaling basis of the primary response) seems problematic. In summary, I really like the first part of the paper, but I think the mutant analysis at the end would require a lot of additional genetic experiments (multiple alleles, cell-specific rescue, perhaps testing other candidates like cca-1 and gpa-6) to justify the authors' conclusions. I think it is probably beyond the scope of this paper to do all these extra experiments, so I would instead recommend the authors correct the most important omissions and otherwise scale back their molecular conclusions. Such a paper would still be a very interesting study. Tanimoto et al. use the well-defined C. elegans chemosensory system to probe the relationship between neural activity patterns and behavior. They combine optogenetics with calcium imaging and behavioral analysis show that ASH and AWB sensory neurons use two different strategies to encode odor information. They also link different calcium channels with these two strategies. Importantly, they claim that the different strategies might explain decision making in behavior. There are some interesting data here, but I feel that some of it has been over interpreted. I do think with some changes, this should be a very interesting story. 1) What are the differences between "bearing at run initiation" and "bearing after a turn"? Does "bearing after a turn" include the turn with the pirouette? It would be nice to see an example trace to recognize these differences clearly. 2) I believe the authors generated panel Figure 2D by comparing dC/dt in 1 sec window to p(turn) in the two different behavioral phases. They then state 'the efficient transitions between discrete behavioral states based on odor concentration information…'. This quote, along with the surrounding text, seems to imply that odor concentration drives the behavioral transition. Although this is likely true, I see no evidence for it here. For instance, let us consider a worm model in which the worm randomly transitions to a high turning mode (one that is insensitive to C). In this model, the worm would still behave differently at every dC/dt value. Although this model may be silly, it demonstrates that there are models that comply with panel D in which dC/dt does not drive behavioral transitions. 3) I don't understand why the authors used two different types of models for 4A and 4B. The AWB model looks like a more biologically realistic model (at least, it's a standard model). I'm pretty sure the AWB model could be fit to both ASH and AWB. For instance, if we use (1/tau) dx/dt = a*dC/dt – b*x(t), we should be able to use a faster time constant to produce ASH (https://www.wolframalpha.com/input/?i=dx%2Fdt+=+1+-+.1*x) and a slower time constant to produce AWB (https://www.wolframalpha.com/input/?i=10*dx%2Fdt+=+1+-+.1*x). I think it is important to use the same (more biologically relevant) model for both neurons if possible. While this might be beyond the scope, an even more realistic model would probably be: (1/tau) dx/dt = a*f(C) – b*x(t) where f is a function representing receptor saturation. 4) It would be nice if the authors clearly label 'contribution of AWB', etc. in panel 5A. Also, the authors find that the 'time-integral' model produces a more robust/accurate behavior (C). This might give more credence to fitting 'time-integral' models to both AWB and ASH (see comments for F4). 5) The authors used unc-13, but I would also recommend using unc-31 to test whether that this might affect the time delay in AWB. 6) Odr-3 results are a bit confusing. Given that the nonanone receptor has not been identified, do the authors claim that odr-3 is coupling to this unknown receptor(s). Or is the property of AWB and ASH modified in an odr-3 loss of function. 7) I would also recommend using cell-specific knockouts of the calcium channels, which would allow the authors to isolate the effect to the neurons being analyzed. Thank you for resubmitting your work entitled "Calcium dynamics regulating the timing of decision-making in C. elegans" for further consideration at eLife. Your revised article has been favorably evaluated by Eve Marder (Senior editor), a Reviewing editor, and three reviewers. The manuscript has been improved but before final acceptance, we would like you to address the relatively minor issues raised by Reviewer #2 and Reviewer #4 below. In the revised version the authors made a good effort to address my concerns. Besides providing additional repetitions for some of their experiments, I requested convincing statistical tests that show whether ASH and AWB imaging data indeed can be better fitted to either one of the models. After their revisions, I am convinced that this is the case for AWB data, which indeed are better explained by the leaky integrator equation. The ASH fitting data however are less convincing. 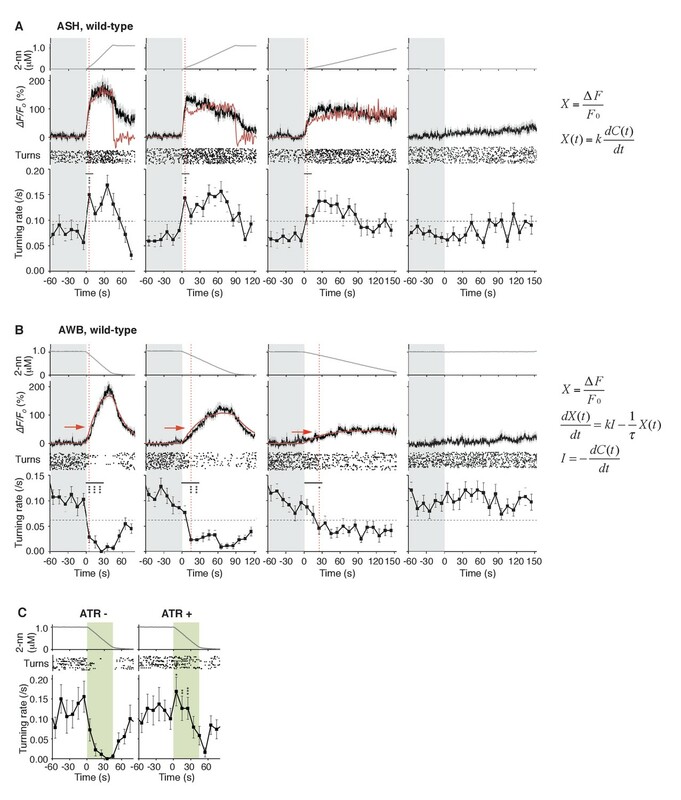 But I agree with the authors that ASH response profiles might be better represented by the time differential during the onset of the response. I think the authors do an appropriate job in addressing this weakness of the study in their discussion, but why leaving future readers with a question mark until they make it to this point. Therefore, I recommend they should give a bit more emphasis on explaining the rather poor fit results for ASH already in the Results section. Allover, I think this paper is a tour de force involving sophisticated technology and analyses. The results are very interesting and provide a working hypothesis for exciting future studies. I think the authors have done a good job addressing previous reviewer comments. It is an interesting study, and I am happy to recommend publication. I am satisfied with this version and the authors efforts to address the reviewer's comments. One additional thing would be to add "saturation of the input" to the standard biophysical model. They could do this by putting the input through a logistic sigmoid or something similar. While this would be nice, it is not essential. I recommend accepting the manuscript for publication. We agree with the reviewer's comment. The problem with the traditional behavioral assay is that it is a closed loop, in which the causal relationship between sensory perception and behavior is not necessarily clear. That is why we introduced the robot microscope system. Using this open loop system, we were able to show that a slight difference in sensory input can cause discrete transitions in behavioral states. In order to establish whether the findings in the open-loop system are comparable to the ones in closed-loop systems, we are planning to extend our current open loop system to development of a closed one in the near future. We mention this point in the Discussion section. Using BIC, the goodness of fit was higher with the time-integral model than the time-differential model for ASH as well as AWB responses (Table 3). However, at the onset of the ASH response, the integral model exhibited delayed increases compared to the real response (Figure 4—figure supplement 3, red arrows). The overall ASH response appeared to fit better by the combination of the time-integral component plus the fast and transient component as shown in Figure 7D, suggesting that ASH has an additional mechanism to quickly respond to a small change in sensory input. However, because the fast and transient component cannot be mathematically expressed at this point, it could not be applied to the result of Figure 4A. 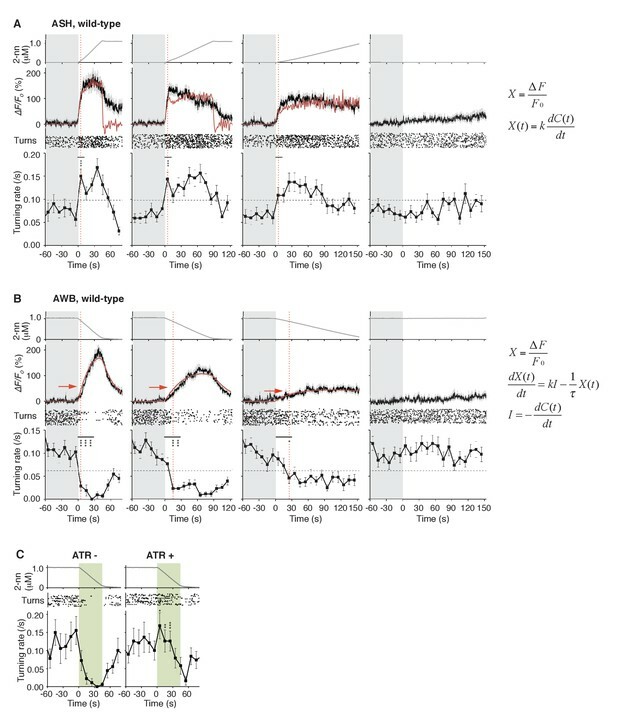 1) As described in the original manuscript, the time-differential response is consistent with other recent reports and with the general idea that sensory neurons have phasic properties to sensitively detect temporal changes in stimuli. As for odr-3, the fitness was much higher in the leaky integrator equation using ∆t as a free parameter than that using ∆t = 1 s (Figure 6—figure supplements 1A and Table 4). We have mentioned these points in the revised manuscript. We apologize that the initial explanation was not sufficient. The 99% prediction interval is a value where future data (odor-up or odor-down phase in this case) will fall with 99% probability based on the observed data (odor-zero or plateau phase, respectively). Using this criterion, we analyzed timing when the unexpected value appeared for the first time in Figure 4A and B. We did this because we intended to investigate the timing of turning rate's change after we have found that the turning rate in the odor-up and the odor-down phases significantly increased and decreased, respectively (Figure 3B). In order to investigate the timing, it was necessary to calculate the changes in turning rate in narrower temporal windows. However, since turning is a rare occurrence, narrowing the time window increases the variation; in order to obtain the same turn number as in Figure 3B (30 or 90 seconds) at the time window of 10 seconds, sampling had to be performed 3 or 9 times. Furthermore, considering comparisons among multiple temporal windows, the use of a regular statistical analysis is not practical. Therefore, we used prediction interval, based on the idea of ​​statistical inference. We described the logic and the calculation in the Results and Materials and methods section, respectively. We appreciate the reviewer's comments. We believe the difference has been made clearer as a result of the additional experiments. In the case of ASH, turning rates in the 45 s and 90 s odor-up conditions (the left-most and middle left panels, respectively) were consistently higher than the prediction interval for the odor-zero phase and were significantly higher than in the no-odor control in the first 10-s bin of the odor-up phase in multiple comparison tests (Figure 4A and Supplementary file 1). Although the turning rate in the 180 s odor-up condition (middle right) in the first bin was not statistically different, the rate in the odor-up phase was also above the 99% prediction interval during the first 90 s; the following decrease may possibly be due to adaptation. For the AWB response in Figure 4B, the 90 s odor-down condition (middle left) exhibited a step-like change in turning rate, although its timing was delayed for 10 s compared to the 45 s condition (left-most). In the 180 s odor-down condition (middle right), we showed that turning intervals were still classified to high- and low-turning states (Figure 1—figure supplement 1E). This result indicates that discrete behavioral transitions occurred at different timings between individuals, resulting in the gradual change of tuning rate as a group. We also found that all the timings passing the 99% prediction interval were associated with statistical differences compared to odor-plateau control (Supplementary file 1). We added statistical arguments and modified the sentences accordingly (subsection “Temporal differentiations and integration of odor information regulate avoidance behavior”). In our experimental conditions, the turning rate changed from a low to a high state (or vice versa), so the overall profiles were similar. Rather, the relevant question is the timing of said changes. As described above, a substantial behavioral change occurred at the onset of the odor concentration increases in all of the three conditions, including the 180 s odor-up condition (middle right) which causes a near-threshold-level behavioral response. In contrast, the behavioral response to the odor concentration decreases occurred at different timings in three conditions according to the rate of decrease. In our view, these results suggest that increasing and decreasing odor concentrations cause a discrete behavioral state transition, but their timings are statistically different, which is related to the dynamic activities of ASH and AWB neurons. These results are consistent with our original claims, and we therefore did not think it necessary to change the sentence. We have toned this conclusion down according to the suggestion. We apologize that the allele names were written only in the strain table in the Materials and methods section, and that the original strain names were not described anywhere by mistake. The strains are mostly reference alleles, and all of them were used in previous studies (see below). We have added the strain names and allele names in the Materials and methods section. We also apologize that the data was not clearly or sufficiently provided in the initial version of the manuscript. First, 2 alleles were used for odr-3 (one allele was presented in the Supplementary Figure). As for other mutants, the strains used here have been investigated for ASH response in previous studies, mostly as single alleles without rescue (Hilliard et al., 2005; Kato et al., 2014; Pokala et al., 2014; Zahratka et al., 2015). In addition, the effects of egl-19 or unc-68 genetic mutations were similarly reproduced by pharmacological antagonists, supporting the idea that the effects were due to the suppression of gene products. (The ASH response under treatment with dantorolene, a RyR antagonist, was added in Figure 7B; it was not presented in the initial submission.) Moreover, the use of an antagonist is more advantageous than using two alleles in one particular way: Pharmacological treatment ensures that the gene product is required in the developed nervous system, not in the developing one. We corrected the sentences accordingly (subsection “Molecular mechanisms of neural computation in the sensory neurons”). Cell-autonomy: Since both AWB and ASH are sensory neurons and unc-13 mutation, which abolishes synaptic transmission, did not essentially affect the neuronal responses (ASH data was also added in Figure 7—figure supplement 1), we think it is reasonable to consider that the effects of genes on calcium responses are cell-autonomous. Taken together, we consider that our main arguments that "ODR-3 and EGL-19 may play important roles in AWB" and "CICR by RyR may also play an important role together with EGL-19 in ASH" are sufficiently supported by the data. Still, we agree that the involvement of these gene products in ASH/AWB responses were not demonstrated directly. Thus, we toned down the offending sentences. 3) Regarding the calcium channel mutants, the results in ASH are hard to reconcile with the results of Zarhatka et al,. 2015. These authors showed that NemA completely blocked cell body calcium transients in ASH in response to a different odorant, octanol. Since presumably both octanol and nonanone are sensed in the cilium, it is hard to explain how the responses they induce could be conveyed to the cell body through different voltage-sensitive channels. Do the authors also see only a partial reduction in octanol response in their system? Is the fast initial response affected by the other (untested) VGCC gene cca-1? Also, the effect of the egl-19 reduction of function mutation is not shown in the figure. How does egl-19(lf) compare quantitatively with the supposedly complete block caused by NemA? Obviously it is not necessary for the authors' nonanone results to match Zarhatka's octanol results, but the differences are striking enough to merit further investigation. We agree that the results of Zahratka et al. appear different from ours. However, it may be difficult to conclude that there is no transient response at all in their experiment because they did not display the temporal profile of the response in the relevant figure. (They showed temporal profiles in other figures, though.) Furthermore, high osmolality stimulation, which also causes calcium response in ASH neurons and avoidance behavior, was not substantially affected by the egl-19 mutation (Kato et al., 2014; Pokala et al., 2014). Thus, these results were completely different although 1-octanol and glycerol were both similarly presented in the aqueous phase in a stepwise manner in these experiments. Because the polymodal ASH neurons respond to a wide range of aversive signals, they may respond to different stimuli with different mechanisms. Still, we agree that the differences are very interesting, and we are planning to investigate this in our next project. We analyzed the T-type VGCC cca-1 mutant and found that the ASH response was not affected (Figure 7B). The loss-of-function allele of egl-19 is not available, possibly due to lethality. NemA-treatment showed a similar or stronger effect than the reduction-of-function egl-19 mutations in the previous studies (Kwok et al., 2006; Zahratka et al., 2015), and a consistent result was observed in AWB neurons in our study (Figure 7A). Thus, we did not analyze the egl-19 reduction-of-function mutation in ASH neurons. As in our response to the second comment, because the AWB response was essentially not affected by the unc-13 mutation, we think it is reasonable to consider that the AWB response is cell-autonomous. In addition, the effect of the odr-3 mutation was analyzed in 2 alleles in the original version of the manuscript (mentioned above). These results suggest that the different AWB responses are likely due to the lack of ODR-3 activity in the neurons. The response of AWB neurons in odr-3 mutants is even larger than that in wild-type animals. This could be due to a developmental effect, as suggested by the reviewer. Still, our mathematical analysis (which was possible because we were able to precisely control the odor concentration input) suggested one possibility: ODR-3 may be involved in the time-differential computation. This idea has never been proposed. We believe that this interesting possibility should be reported to the readers, but agree that more experiments are needed to fully prove our contention. Therefore, we toned down the related sentences. Sorry for the confusion. In Figure 1E, the bearing at run initiation is the direction of the root of the blue long arrow, and the bearing after a turn is the direction of the root of the blue long arrow and of the red short arrow. We added an explanatory sentence (Figure 1 legend). As pointed out in minor comment 3 of reviewer # 2, the causality is not known at this stage, and our argument is only one of the possibilities. We made this clear in the text (Results section). Please refer to the response to major comment 2 of reviewer #2 (the 2nd and following paragraphs). According to the suggestion, we modified Figure 5A. For ASH's "time-integral" model, please refer to the comment above. According to the suggestion, we analyzed the unc-31 mutants, required for the priming of dense core vesicles, and found that the response also fit the leaky integrator equation. We added the data in Figure 6A and mentioned this in the text (subsection “Temporal integration of sensory information occurs in AWB neurons”). We assume that reviewer # 4’s concern is whether ODR-3 Gα is more likely activated by an odorant receptor for sensory signal transduction, or by a neuromodulator receptor to regulate the response of AWB and ASH. From genetic studies so far, the GPCR -> Gα -> cGMP -> cGMP-gate cation channel pathway is considered to be activated in AWB neurons (Bargmann, 2006). In addition, ODR-3 is expressed in only a few pairs of sensory neurons, and localizes at the sensory ending (i.e., sensory cilia), suggesting that ODR-3 is involved in sensory signaling (Bargmann, 2006). On the other hand, other Gαs, such as GOA-1, are expressed in many neurons and have been suggested to function downstream of neuromodulator receptors (Bastiani and Mendel, 2006). We added sentences in this regard (subsection “Molecular mechanisms of neural computation in the sensory neurons”). As mentioned in the response to major comment 2 of reviewer # 3, because the cell responses were essentially not affected by the unc-13 mutation, and because they are sensory neurons, we believe it is reasonable to think the effect is cell-autonomous. We appreciate the reviewer's positive feedback and suggestion. We have added a sentence to provide the explanation of the ASH fitting ASH to the Results section. We appreciate the suggestion. We have added a sentence regarding the consideration of input saturation to the Materials and methods section. We thank K Tanaka (FIS Inc., Japan), Y Mori (HawkVision Inc., Japan) and K Ishida (Aska Company, Japan) for generous technical support for the hardwares. We also thank Drs. Y Fujie, I Takeuchi, M Usuyama, M Hendricks, Y Zhang, A Gottschalk, P Sengupta, H Kagoshima, M Koga, S Oda, T Obara, M Chen for materials and technical support, C Bargmann, S Nakanishi, Y Komura, T Kikuchi, M S Kitazawa, O Hobert, K Fujimoto and the Kimura laboratory members for suggestions and comments. 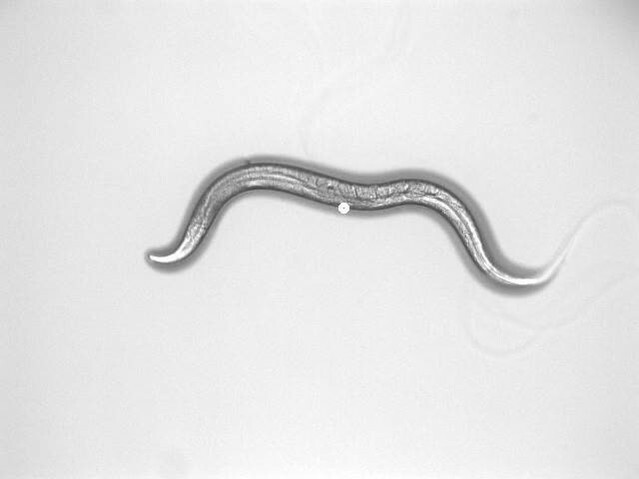 Nematode strains were provided by the Caenorhabditis Genetics Center (funded by the NIH Office of Research Infrastructure Programs P40 OD010440), and neuronal information was provided by WormBase (funded by National Human Genome Research Institute grant #41 HG002223) and by WormAtlas (http://www.wormatlas.org). © 2017, Tanimoto et al.